Posted: April 9, 2018 in Icons & Iconoclasts, Who,What,Where & When...? I love Quentin Miles wonderful clear period photo of the fun of the fair and especially the business end of the last car built in the most famous range of Australian Specials- not that the ‘Special’ descriptor does justice to the quality of the design and construction of the Maybachs under Charlie Dean’s leadership at Repco Research in Sydney Road, Brunswick, in Melbourne’s inner north. 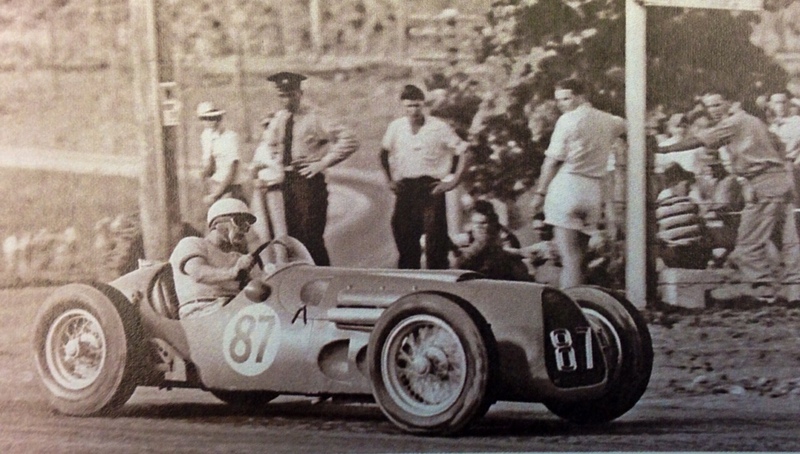 Jones’ forceful speed and the ongoing evolution of the Maybachs kept the cars at the forefront of Australian single-seater racing into 1955 but game-changers were the arrival of modern ‘red cars’- Lex Davison’s acquisition of Tony Gaze’ Ferrari 500/625, Reg Hunt’s Maser 250F powered A6GCM and his subsequent 250F to name two. Stan gave up the unequal struggle and acquired a 250F, ultimately doing very well with it- winning the ’58 Gold Star and the ’59 AGP at Longford, thank goodness he finally won the race in which he had deserved to triumph for the best part of a decade. Even though the Maser was his front line tool he was not averse to giving Maybach a gallop, as here on the Queensland airfield circuit. As Stanley focussed on the Maserati, Maybach 3 languished in a corner of Ern Seeliger’s workshop in Baker Street, Richmond. 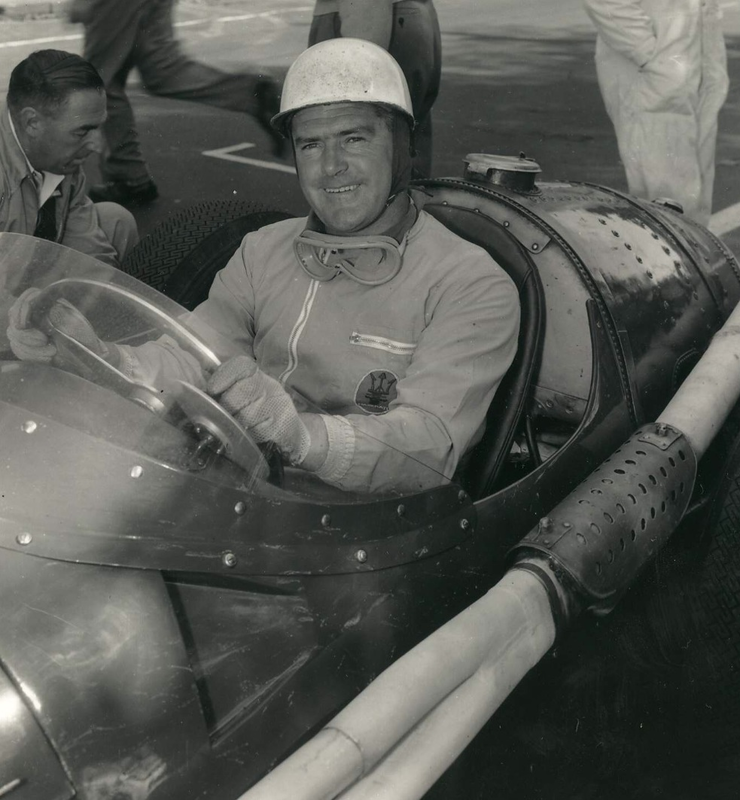 Ern was a successful racer, engineer/preparer and a close friend of Jones. With a view to selling it Stan handed Seeliger the car telling him to ‘do what he liked with it’. The essential elements of Maybach 3 were a chassis built up from two 4 inch diameter steel tubes, the Maybach 3.8 litre, 260 bhp, SOHC 6 cylinder engine fitted with a Charlie Dean/Phil Irving designed and carefully cobbled together fuel injection system, the engine laid down at an angle of about 60 degrees to the left to lower the bonnet line, like the W196- the car was also styled along the lines of that Benz. The cars front suspension comprised upper wishbones and a lower transverse leaf spring and at the rear utilised quarter elliptic leaf springs and radius rods. Brakes were PBR drums and the gearbox a 4 speed manual. Towards the end of its life the limiting factor of Maybach 3’s performance was the end of Charlie Dean’s supply of Maybach engines, no more power could be squeezed from them- and there were none left in any event! Pretty soon a 283 Chev was on its way to Australia, Seeliger modified the 4.6 litre V8 by fitment of two Carter 4-barrel carbs, the cylinder heads and valve gear were ported, polished and lightened, with the oilways modified and the unit dry-sumped. The motor produced about 274 bhp @ 6000 rpm and had a truckload of torque- around 300 lb feet of it at 3500 rpm. Ern and his band of merry men did not just plonk the engine into the space formerly occupied by the German straight-six however. Seeliger thoroughly overhauled the machine, lengthening the chassis to accept the de Dion rear end he designed to better put the cars power and torque to the road. A transverse leaf spring was installed instead of the quarter elliptics and an anti-roll bar used at the front incorporating brake torque rods. The rear track was widened by an inch and a larger 30 gallon fuel tank fitted to feed the thirsty Chevy. Seeliger designed and built a multi-plate clutch which used the existing Maybach 4 speed ‘box and diff albeit modified with shortened axles and cv joints to mate with the de Dion tube. Ern made the cars debut in this form at Fishermans Bend in March 1958, his bid for victory came to an end with stripped tyres- the car was quick right out of the box, Seeliger a mighty fine design and development engineer. 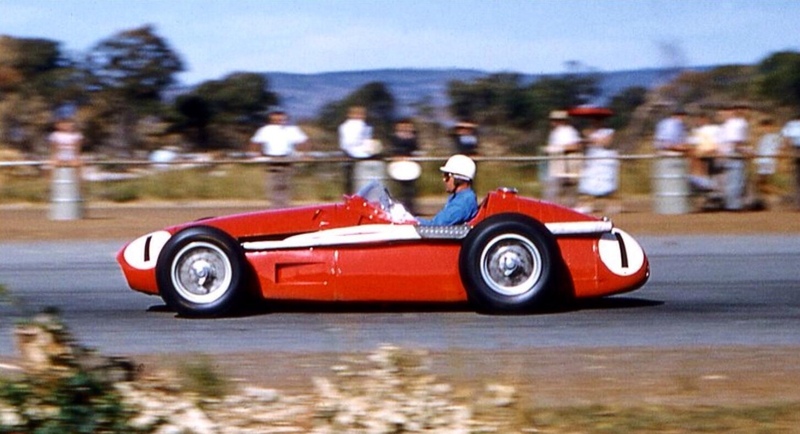 Whilst a very good driver he was not in Stan’s league- Jones was stiff not to win the ’58 AGP at Bathurst aboard his 250F- as was Ted Gray unlucky to dip out in Tornado 2 Chev, but Seeliger finished 2nd in the Maybach with Lex Davison, always a lucky AGP competitor, the winner. Be in no doubt my friends Maybach 4 Chev in Jones hands was a winning car- had he felt so inclined in 1958 but he was busy winning the Gold Star aboard the 250F in any event. Into 1959 Maybach 4 was still competitive in Ern’s hands, and Stanley took a win in the Gold Star, South Australian Trophy event at Port Wakefield in late March and 3rd place in the Lowood Trophy race as pictured in this article behind the Cooper Climaxes of Alec Mildren and Bill Patterson. Before too long Stan would show his speed in a Cooper T51. Posted: August 16, 2017 in Fotos, Who,What,Where & When...? Tom replaced the cars Bristol engine and fitted a Repco Hi-Power, Phil Irving designed head breathing much life into the standard 6 cylinder, OHV, inline Holden 6 cylinder ‘Grey Motor’. The engine raced at 2.3 litres in capacity. The interesting thing is exactly where on Mount Panorama the shot is taken. The right hander at the top of Mountain Straight perhaps, ‘Quarry Corner’? All suggestions taken. Its a quintessential Australian country scene, in the absence of a crowd it could be anywhere! Posted: January 8, 2016 in Fotos, Who,What,Where & When...? The win was timely, he was monstered all the way by Len Lukey’s Cooper T43 2 litre, the way of the future of course. 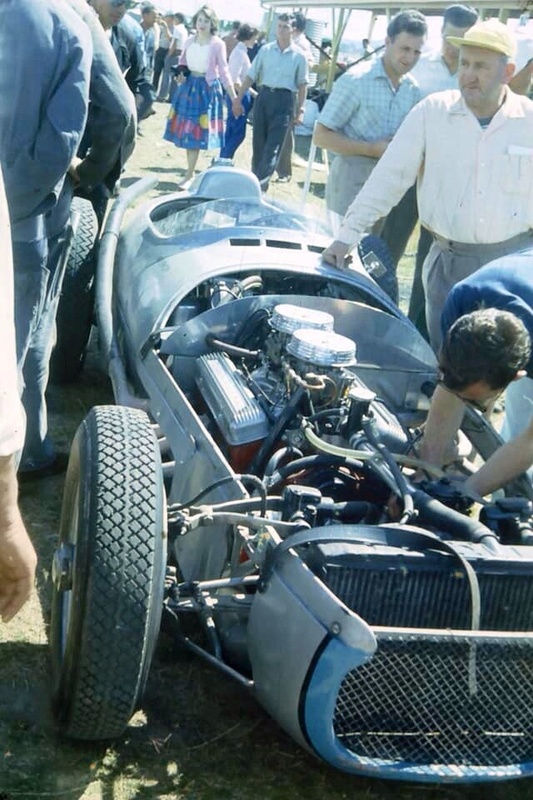 ‘Twas the last AGP win for a front engined car, mind you Lex Davison came within metres of winning in an Aston Martin DBR4 at Lowood, Queensland in 1960. 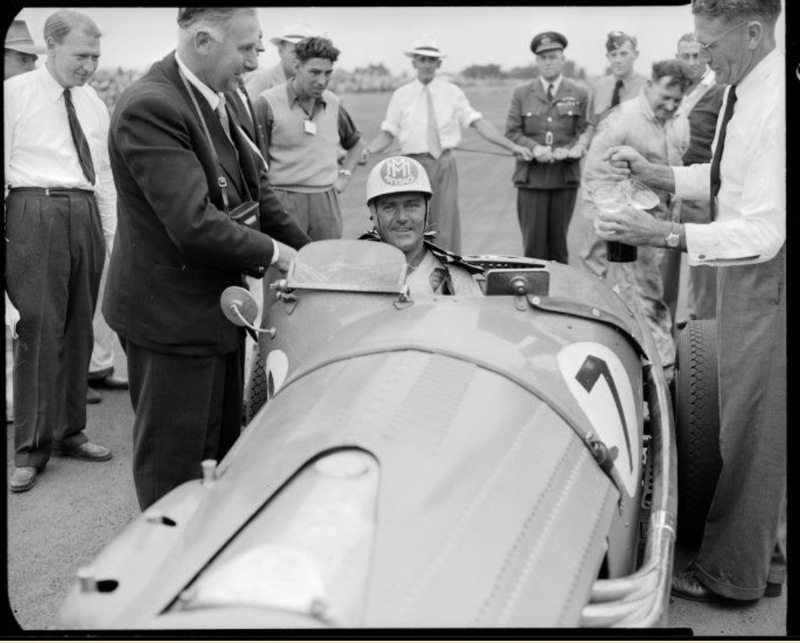 Stan’s was a well deserved victory, he and his team lead by Otto Stone had a car which was consistently and reliably fast. Perhaps his driving now had a more measured approach to match the fire and pace which was never in doubt. Jones gave his Gold Star defence a red hot go in 1959 having won the title in 1958, he raced four cars in his quest. He didn’t race in the season opening event in Orange, NSW. Jack Brabham won in a Cooper T51, but he wheeled out his Maybach for Fishermans Bend’s ‘Victoria Trophy’ on 22 February. He finished second t0 Alec Mildren’s Cooper T43. Stan hadn’t raced the Maybach for years but had retained it. His friend and fellow racer Ern Seeliger evolved the car by replacing the Maybach engines which had been at the core of Maybach’s 1-3 with a Chev Corvette 283cid V8. The car also had a De Dion rear end and other clever modifications. He swapped back into the Maser, winning the AGP at Longford on 2 March. He switched back to the Maybach for the ‘SA Trophy’ at ‘Port Wakefield’ on March 28, winning the race. Crazily, the next round of the title was at Bathurst on 30 March, two days later. Very hard for contestants to make that trip from SA to Central NSW now, let alone with the road system of 1959! Stan flew to Bathurst to drive the Maser. Whilst he won his heat he had engine dramas in the final and failed to finish, victory was taken by Kiwi Ross Jensen in another Maserati 250F. He used the Maybach again at Lowood on June 14, he was third, then swapped back to the Maser for the next round, again at Lowood on 30 August, hitting a strawbale and failed to finish. ‘Mid-engined inevitability’ was clear though despite none of the Australian Cooper exponents being able to secure a full 2.5 litre FPF Coventry Climax engine…yet. The ‘mechanical mice’ as Lex Davison christened the Coopers were only going to get quicker. Whilst his fellow competitors were back at Port Wakefield for the 12 October meeting Stan was doing a deal with Bib Stillwell to buy his Cooper T51 2.2 FPF, chassis ‘F2-20-59’, the first of several T51’s Stan raced. He soon got the hang of the car, after all he had been an ‘air-cooled’ Cooper exponent earlier in the decade, finishing second to Len Lukey’s Cooper at Caversham, WA. The final rounds of Australia’s longest ever Gold Star series were Phillip Island’s ‘Westernport Cup’ and ‘Phillip Island Trophy’ races on 22 November and 13 December respectively. 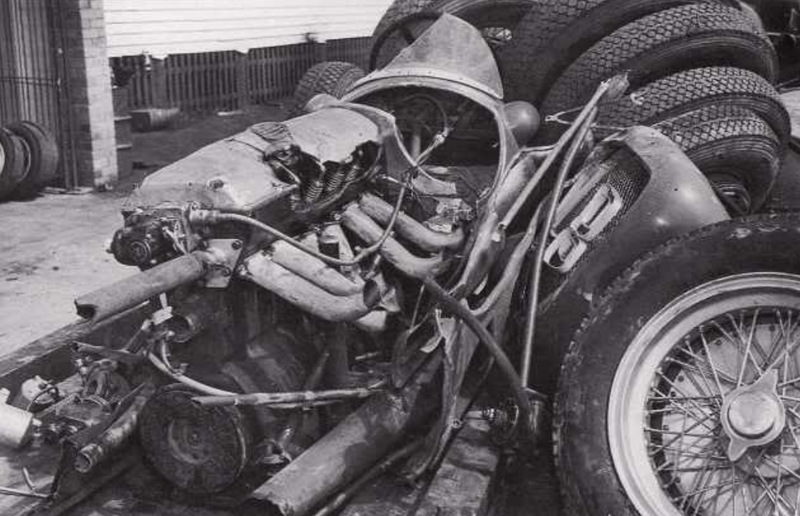 Jones brought his ‘roster of cars’ to four for the year when he drove Ern Tadgell’s Sabakat (Lotus 12 Climax) after damaging his Cooper in a collision with Lukey. The Cooper was too badly damaged to start, as was Lukey’s but Stan, very sportingly was lent the Sabakat by Tadgell. Lukey won the 1959 title from Alec Mildren by 2 points with Jones a distant third. Mildren’s time would come in 1960 with fabulous AGP and Gold Star wins in a new Cooper T51 Maserati he and his team built over the summer. Sadly it was the ‘last full-blown’ Gold Star campaign for Jones, economic pressures from 1960 on meant he did a few title rounds but was not a serious title contender, although still a tough competitor in any individual race he entered. When Alan Jones won the 1980 Australian Grand Prix at Calder, he and his father Stan joined the Ascaris as the only father/son combination to win their home Grands’ Prix. 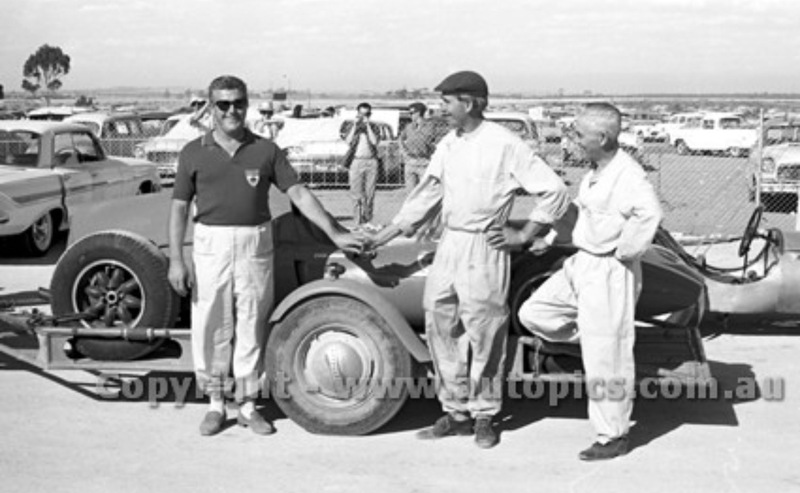 Antonio Ascari won the 1924 Italian Grand Prix in an Alfa and his son Alberto won it in 1949, 1951 and 1952 for Ferrari. 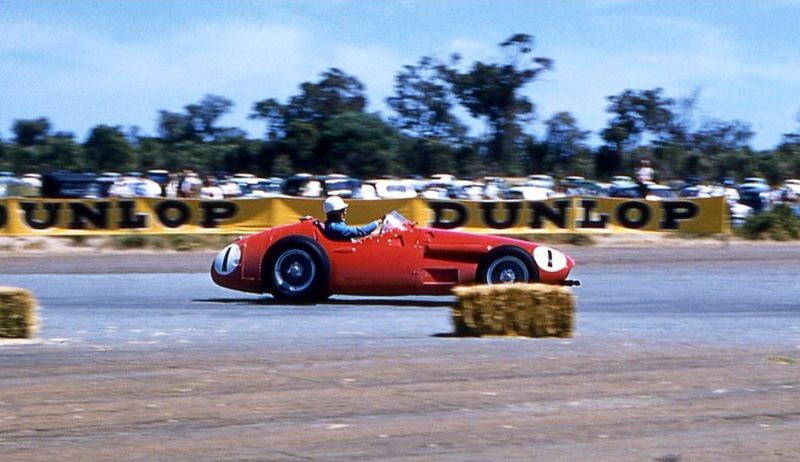 Stan won the 1959 AGP at Longford in his Maserati 250F, the last AGP won by a front engined car. Graham and Damon Hill both contested the British Grand Prix, Damon winning in 1994 aboard a Williams Renault, whilst Graham came close he never had a hometown win. His luck in the UK as bad as it was good in Monaco where he won five times! Similarly, Gilles and Jacques Villeneuve both contested the Canadian Grand Prix but only Gilles took a win, for Ferrari in 1978. Sadly, all four fathers had one thing in common, they all died before their sons achieved Grand Prix success. Alberto and Gilles in testing/race accidents, Graham in the light aircraft he was piloting together with his team and Stan of natural causes at the very young age of 49. Like so many of my articles, the one on Stan started with a photo, the one above at Longford. I figured the article would be short but the more I dug, and there is not a lot of information available on Jones, the more interested I became in him and the series of Maybach cars which were such an important part of his career. So, it’s ended up rather long! but I hope of interest to some. I leaned heavily for the information on the Maybach phase on Malcolm Prestons’ great book ‘From Maybach to Holden’, sadly, Malcolm died a month or so ago. He was very kind and helpful to me with the article on John McCormacks’ McLaren M23, that article in many ways the inspiration for starting this blog, so I dedicate this article to him. RIP Malcolm Preston. 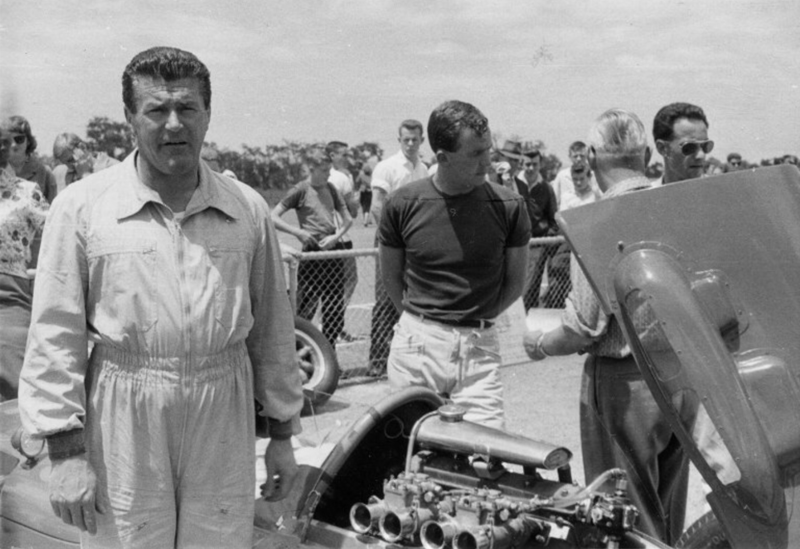 Much has been written about Alan of course but not so much about Stan, one of the great drivers and characters of Australian motor racing in the immediate post war years until the dawn of the 1960’s. He was raised in Warrandyte, then a rural hamlet 24Km north-east of Melbourne, still semi-rural now, by his mother and grandfather. He served in the Australian Armed Forces based in Darwin during World War 2. He married Alma O’Brien circa 1940, Alan was born on November 2 1946. Stan commenced motorsport after being encouraged by Otto Stone, a racer and engineer who would later make a great contribution to his success as an elite driver. 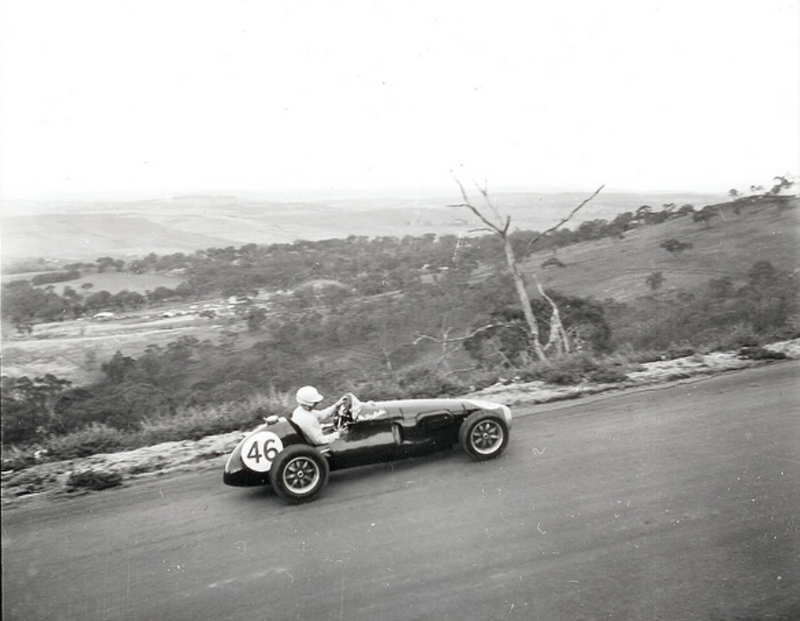 He competed in his MGTC at Rob Roy Hillclimb, at Christmas Hills, not far from where he grew up in 1948. 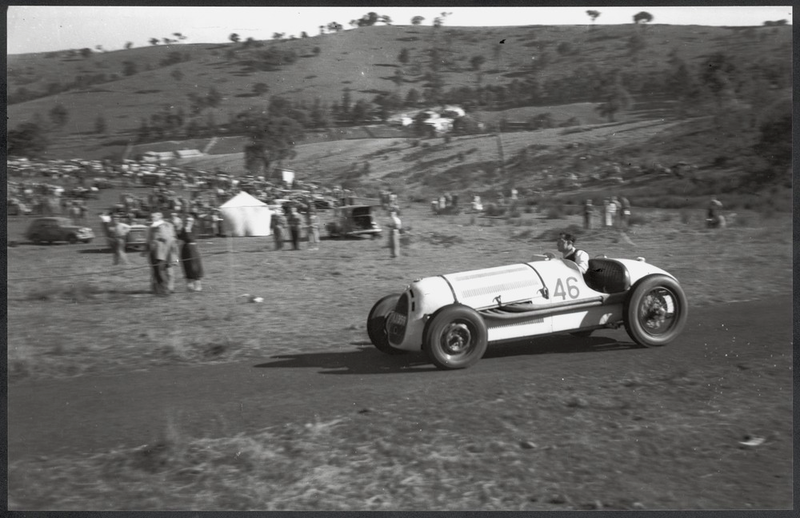 Stan was soon a keen competitor in all forms of the sport including trials twice winning the Cohen Trophy awarded to the best trials driver of the year by the Light Car Club of Australia. In 1951 he also bought an Allard J2. These faster cars were funded by ‘Superior Cars’ a dealership he opened in Richmond, yards in Coburg and South Yarra followed, northern and inner eastern Melbourne suburbs respectively. The turning point in Stan’s career was the association with Charlie Dean, the ‘Maybach’ racers which Dean built and the ‘Skunkworks’ at Repco, which continued to develop the car and its successors after Jones acquired it. Charlie’s business named ‘Replex’, manufactured large industrial transformers. 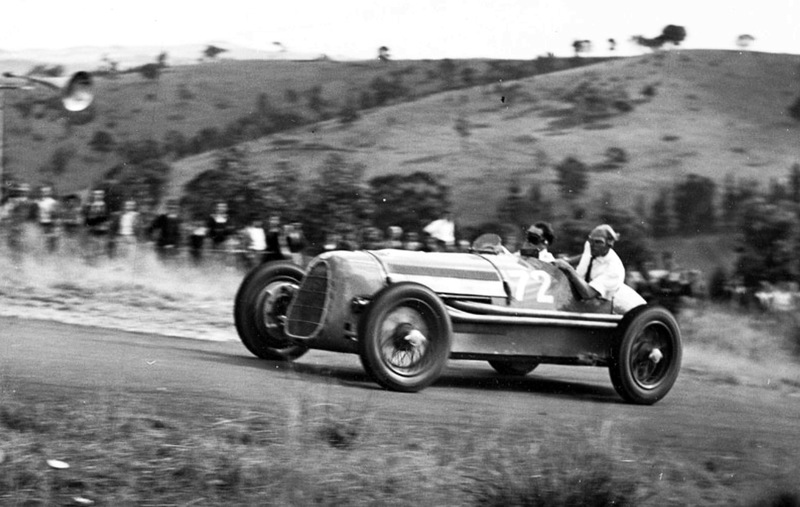 He became involved in the Australian Motorsports Club, and using his wartime knowledge of sophisticated German engines, sought a suitable motor to form the basis of a special. A friend who operated a war surplus wrecking yard was briefed and Charlie was soon the owner of a ‘Demag’ half-track armoured personnel carrier. Critically, it was powered by a Maybach 6 cylinder 3.8 litre SOHC, cross flow engine. The block was cast-iron, the head aluminium, the crank ran on 8 main bearings, and in standard form the engine produced 100bhp at 2800rpm but the engines performance potential was clear to Dean. Initial modifications involved fitment of twin Amal carbs to a fabricated manifold, increasing the compression ratio to 8:1 by planing the head, fitment of a Vertex Magneto and a re-ground cam to increase valve lift and duration. At about the time Dean started to build ‘Maybach 1’, he sold his business to Repco, being retained to run it, this gave him both time for his hobby and access to Repco’s resources. The engine was fitted into a tubular chassis, the basis of which was 2 4 inch diameter 10 guage mild steel tubes to the front of which was mounted suspension mounting framework. Front suspension comprised a transverse leaf spring with suspension arms and stub axles from a 1937 Studebaker Commander. Rear suspension was of conventional semi elliptic leaf springs, Luvax lever-arm shocks were used. A Fiat 525 gearbox drove an open prop-shaft to a Lancia Lambda 7th series rear axle. A Jeep steering box was used. Standard Studebaker brakes and wheels were used at the front, and Lancia brakes, hubs and wheels at the rear. It was a quick sports car and was soon developed further for competition use, Charlie debuting it at Rob Roy Hillclimb in 1947. The development of Maybach was constant and ongoing, the ‘program’ having strong Repco support due to its promotional value and development of its engineers. 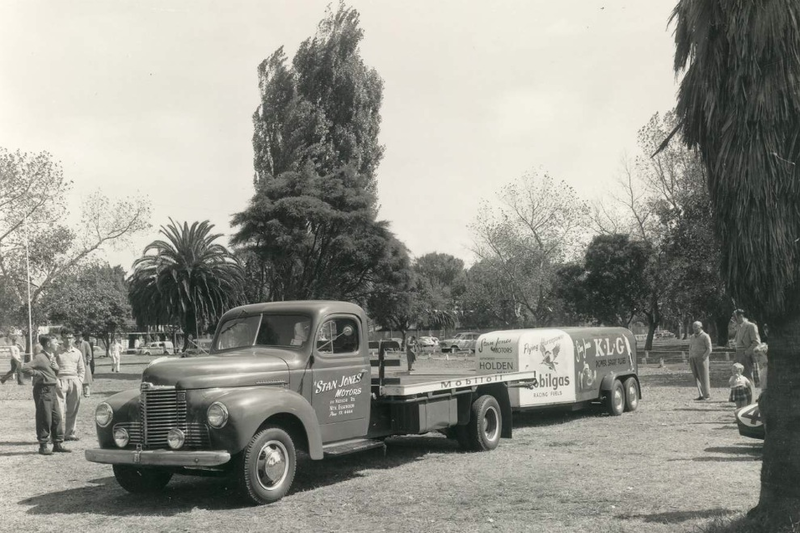 In 1950 Dean was appointed to head up a Research Centre for the Repco Group, located at the ex-Replex premises at 50 Sydney Road, Brunswick…from acorns do great oaks grow. By the time Stan bought ‘Maybach 1 Series 3’ the body was still a 2 seater. 3 feet of rear chassis rails had been removed from the original, it had rear axle mounted trailing quarter elliptics with radius rods.The engine was 4.2 litres and used 3 2 3/16 inch SU carbs, had a compression ratio of 9:1, and a reliable (sic) Lucas magneto. After the SU’s were fitted the engine developed 200bhp @5000rpm. Tyres were 16×6.50 touring type. A 1922 American truck ‘Power Lock’ ‘slippery diff’ was adapted in the Lancia housing which was modified to suit. The brakes had also been changed substantially using 16 inch/ 14 inch drums front/rear. 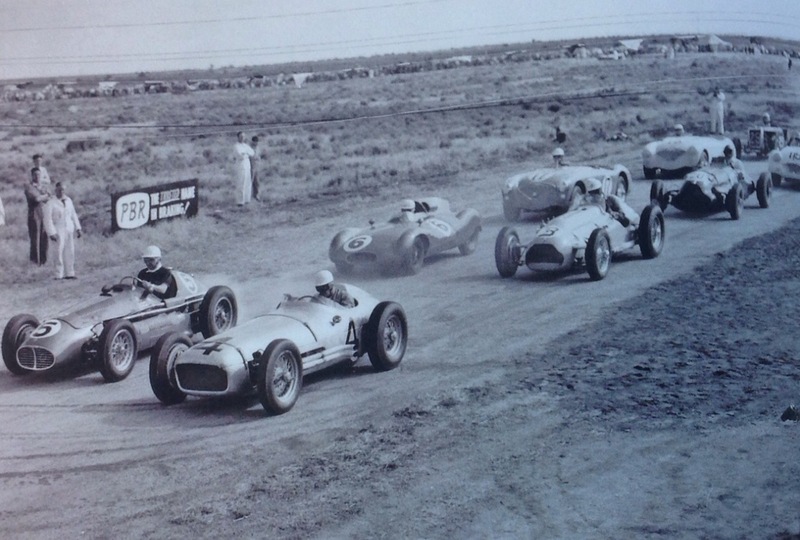 Stans’ first race in the car was at Gawler, South Australia, the main scratch race setting the pattern for the season with Jones and Doug Whiteford in the Lago Talbot fierce rivals, the two cars passing and repassing before Whieford won the event. 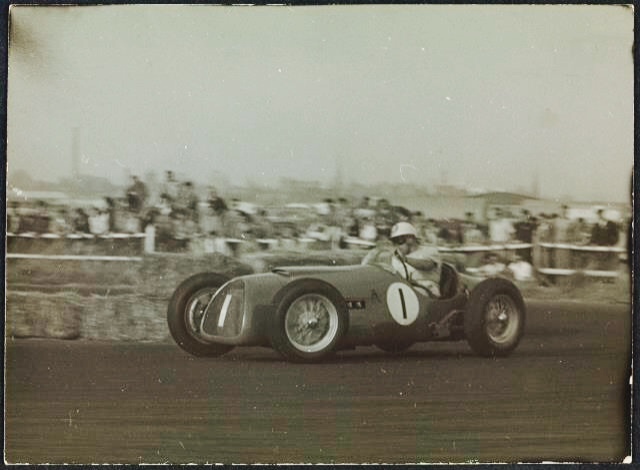 Jones then raced the car at Bathurst in October 1951, winning a 3 lap scratch race but finishing second to Whitefords Talbot-Lago in the 50 lap handicap. The following week Jones again finished second to Whiteford at Woodside, a road circuit in the Onkaparinga Valley in the Adelaide Hills. He adapted to the car quickly and well having progressed from a low powered road going TC to one of the fastest cars in the country in less than 3 years, his money allowed it but he still had to extract all the car had to offer. Which he did from the start. He next raced the car at the Ballarat Airstrip in rural Victoria, winning both the Victoria and Ballarat Trophies from Lex Davisons Alfa P3. 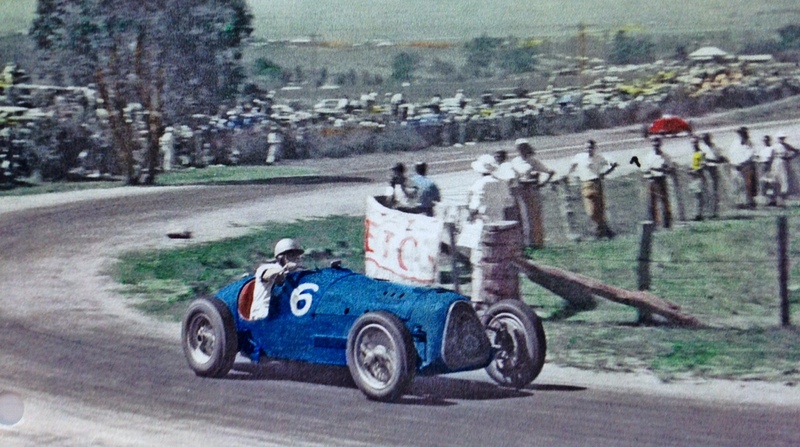 As Stan became used to the car he became quicker and quicker, it was a considerable step up for him in terms of the performance of his preceding cars, he was the favourite to win the AGP at Bathurst in 1952, but excessive tyre wear resulted in a victory for Whitefords’ Lago, Stan finishing second having stopped 6 times to replace rear tyres, the 6 ply touring tyres used on the 16 inch wheels, running hotter than 4 ply racing tyres. The racing Pirellis on order had failed to arrive on time, it’s interesting to reflect on ‘supply-lines’ in those far off days between Australia and Europe. The car won three Victorian Trophy’s, the big race on the Victorian calendar, all at Fishermans Bend, another airfield circuit in Melbournes’ inner West. The first was in 1952 the car beating Whiteford with specially made 4 ply tyres for Maybach. 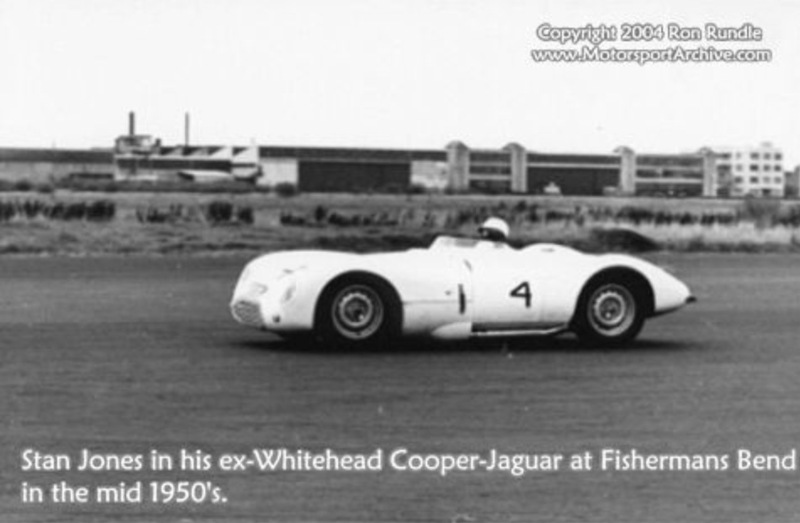 In 1952 stan also raced a newly acquired Cooper Mk 4 Jap 1100, successful on both the circuits and the hills. 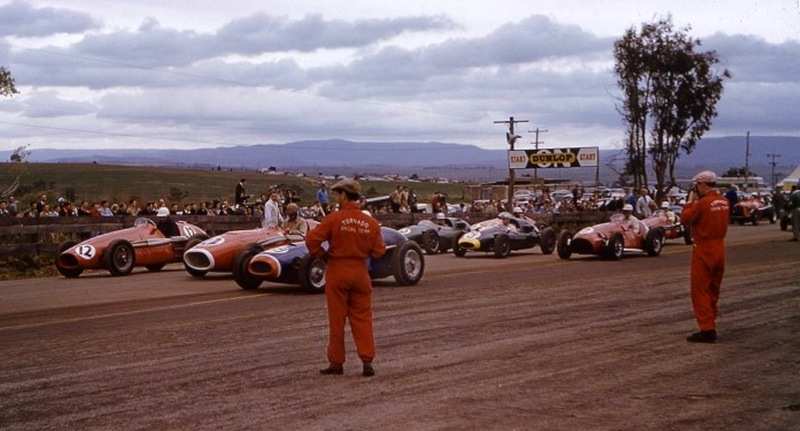 On New Years weekend 1953 the new Port Wakefield circuit opened with Jones taking another win, he had been unbeaten in all but a couple of minor handicap races since the ’52 AGP, the sensation of the weekend the blowout of a tyre on Davisons Alfa and multiple roll over. 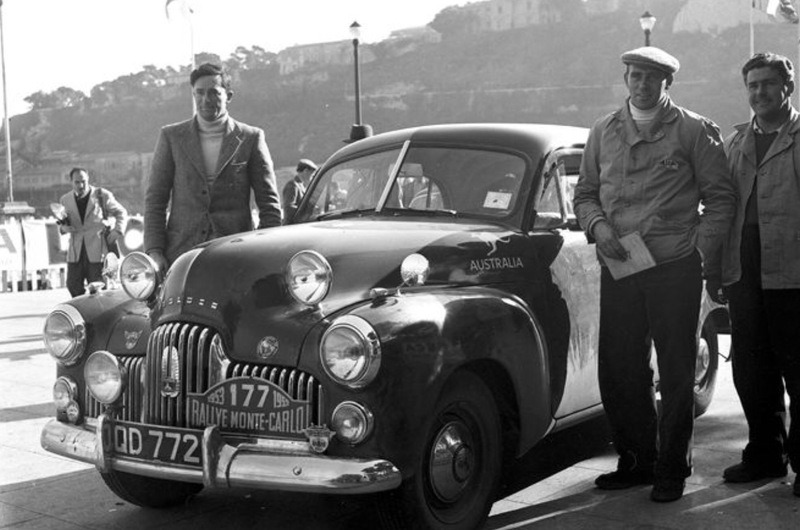 He was a lucky boy as only a week later Davo, Jones and Tony Gaze set off to Europe to compete in the 1953 Monte Carlo Rally. The racers were competitive, finishing 64th, at one stage having been in the top 10 amongst much faster cars in a field of 440 far more experienced teams in a Repco prepared Holden FX or ’48-215′. 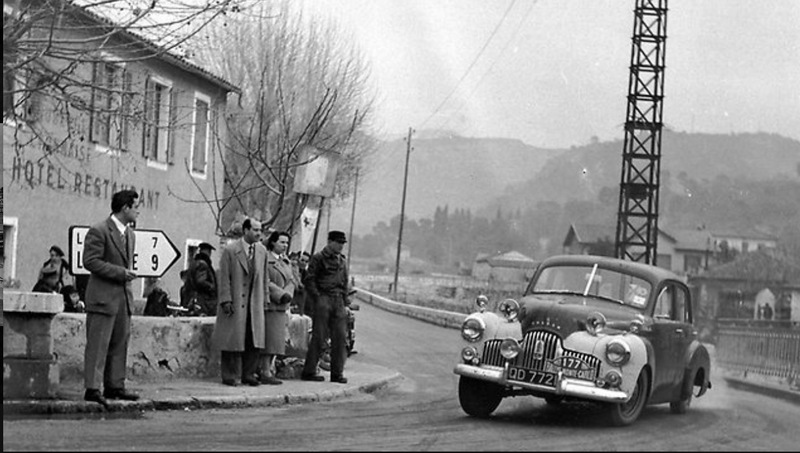 Graham Howard describes this as ‘one of the great feats of Australian motoring, this trio clean-sheeted from Glasgow to Monaco and then finished 64th after minimal reconnaissance, in the final elimination, with Jones working stopwatches while sitting sideways across the front bench seat so he could use his feet to brace Davison behind the wheel’. 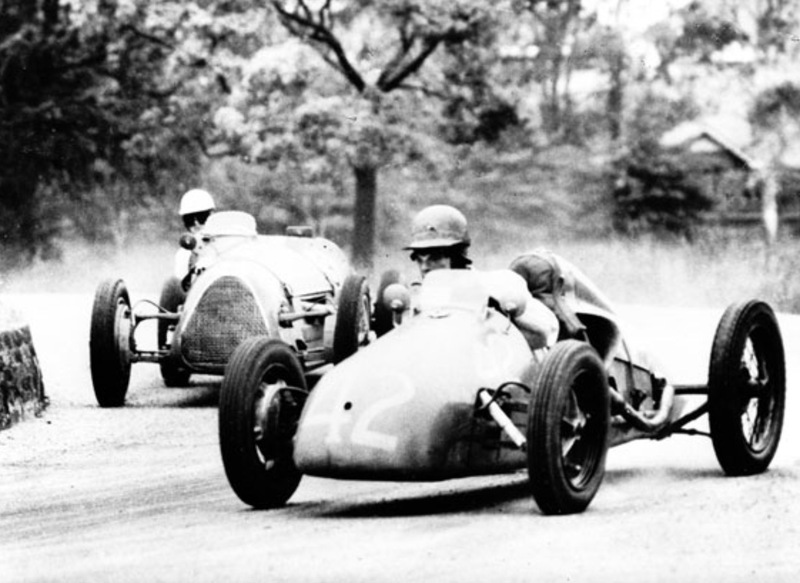 Stan lead the 1953 AGP at Albert Park… its inaugural meeting, by lap ten he was ahead of Whiteford by thirty seconds, by lap fourteen he and Whiteford had lapped the field, indicative of both their pace and dearth of outright contenders in Australian racing at the time. The Maybach needed fuel and a replacement water pump drive belt. Jones then had to vacate the cockpit when he was splashed by methanol. Sluiced with water he rejoined the race, only for clutch failure to end a brave run, Doug Whiteford won in his Lago Talbot. Some compensation for Jones was fastest lap at 2 mins 03 seconds, an average of 91.46MPH, imagine that Victorians who can remember the ‘circuit’ in its pre-modern era format? 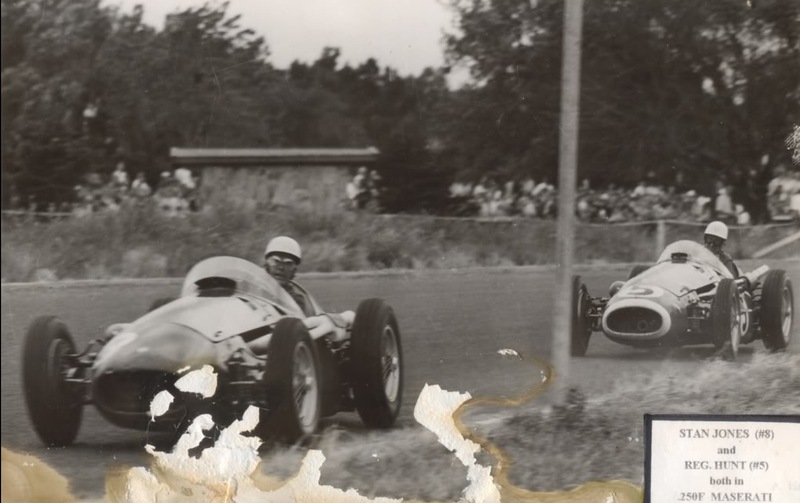 Stan was said to be hard on his cars, but he also had poor luck, but everything finally came together for Jones and Maybach with a win in the first NZGP at Ardmore in 1954. He beat a class field which included Ken Wharton in the BRM P15 V16, Peter Whitehead Ferrari 125, Horace Gould and Jack Brabham in Cooper Bristols and Lex Davison and Tony Gaze, both driving HWM’s. It was a triumph over adversity as the car threw a rod in practice punching a sizable hole in the crankcase and damaging a cylinder bore. Dean ‘phoned Australia for spares which could not be delivered in time. Undeterred, the team; Dean, Otto Stone, Jack Joyce, Bib Stillwell and Don Busch scoured town, patched the crankcase and machined both a GMC rod whose weight was carefully matched to the originals, and a new cylinder liner. The engine was running by 10.30AM on Sunday morning. Stan catching some ‘beauty sleep’ to be raceready, the races duration 2 hours and 45 minutes, the patched Maybach and Jones doing justice to the ingenuity and resilience of their small team. When they returned from NZ the team began work on a new monoposto, the chassis similar in layout to Maybach 1 but adapted for the narrower and lower body. The rear axle was of ‘speedway type’ which allowed a lower propshaft and easier change of gear ratios. Monroe Wylie tubular shocks were fitted at rear. Front suspension used Chev upper control arms. The new rear axle was attached to quarter elliptic springs but with revised control arms and a Panhard rod. Les Tepper built the chassis, Brian Burnett and Bob Baker the body. Great attention was paid to reducing weight, aluminium was used for the body, the cars’ weight reduced from 19.5 to 16Cwt. The engine was rebuilt with a capacity increase to 4250cc by increasing the bore to 91mm. Power was 257bhp @ 5200rpm and torque 288lb ft @ 3000rpm. The compression ratio was 11:1 and the 110 octane fuel was an intoxicating brew of 60% methanol, 20% benzol and 20% av gas. The fuel tank fabricated by Burnett held 25 gallons. The same brakes were used with the addition of air scoops to the front backing plates and a dual master cylinder supplied by Patons Brakes. Peugeot rack and pinion steering replaced the earlier Jeep cam and roller setup. 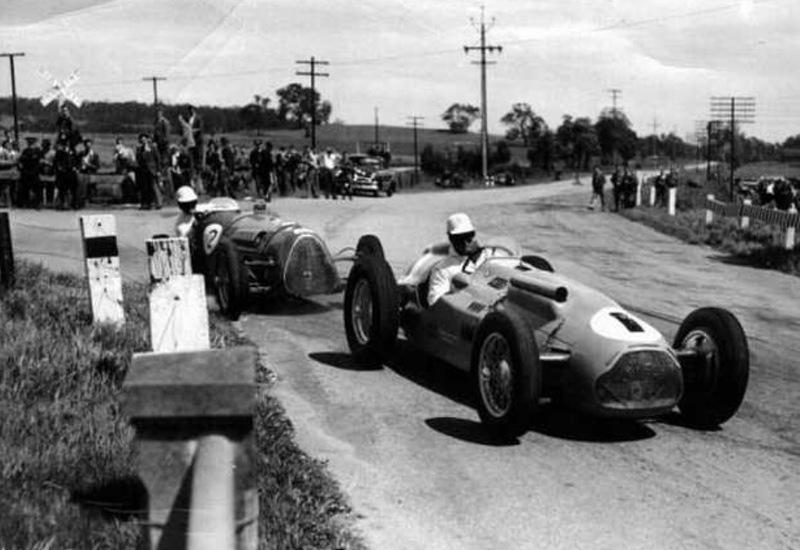 The first race for Maybach 2 was the Victorian Trophy at Fishermans Bend in March 1954. Jones won the race lapping the entire field with Brabhams’ Cooper T23 Bristol 3 miles behind! Further preparation for the AGP was the ‘Bathurst 100’ at Easter, 18000 spectators attended the event, one of the ‘most successful meetings ever stage at the circuit’ according to ‘The Sydney Morning Herald’. Jones won a preliminary race on Saturday but broke the gearbox in a handicap event late in the day. W Clark’s HRG won the handicap ‘100’ from Brabhams Cooper Bristol and Stan. Jones won a 3 lap scratch race in the morning, the Maybach was timed at 132.6 mph over the flying quarter-mile. Not a bad reward for the mechanic who drove back to Melbourne overnight to collect a spare ‘box! Maybach 2 was also raced at Altona twice and again at Fishermans Bend in October in the lead up to the AGP, achieving success in the first of the 2 Altona meetings in May. He lost to Brabhams’ Cooper T23 Bristol in the handicap at Altona in June and had gearbox failure at Fishermans Bend in October. Demonstrating his versatility as a driver, Stan competed in the 1954 Redex Round Australia Trial in the Repco ‘prepped Holden FJ navigated by CAMS co-founder Don Thomson, finishing equal fifth. He also continued to compete in the Cooper with at least 3 wins on the circuits and again success in the hills, including lowering the Rob Roy record which had stood for 3 years. 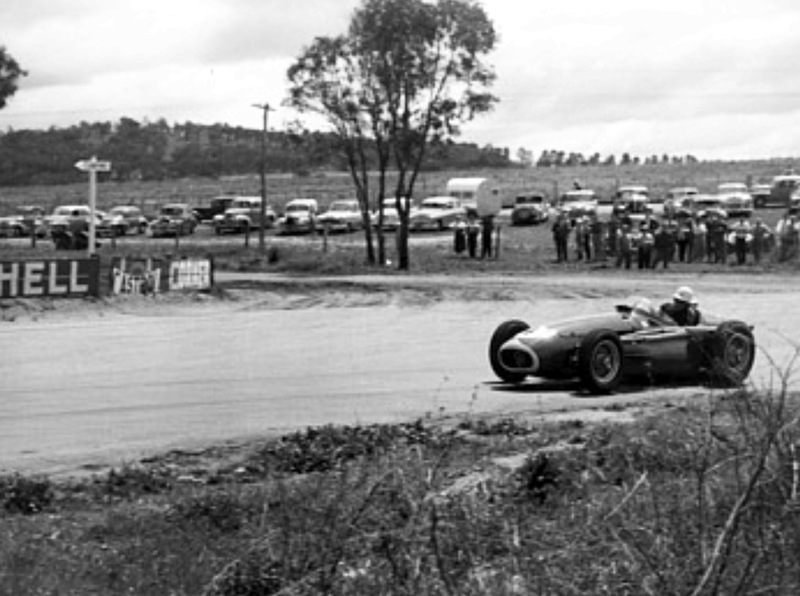 The 1954 AGP was held on public roads at Southport on the Gold Coast not far from Surfers Paradise. The roads were bumpy, were recently sealed, having loose gravel shoulders some humps and two defined ‘no-passing’! sections. The crcuit was 5.7 miles long with a race distance of 155 miles or 27 laps. It promised to be a tough event. Jones lead from the start, initially from Davisons HWM Jag and Brabhams Cooper , Malcolm Preston in his fantastic book ‘From Maybach to Holden’ records ‘…Jones was reportedly maintaining a furious pace and consistently lifting all four wheels off the ground over one of the humps…On lap 14, whilst negotiating the S bends the Maybach ran onto the gravel. As Jones endeavoured to steer the car back onto the road it spun and careered backwards into the roadside trees at an estimated 100mph…passing between 2 large trees, one tree caught the side of the engine, ripping the carburettors and front suspension from the car, whilst the body containing Jones continued a little further on its side . Jones emerged uninjured from the wreckage apart from a small cut on his lip’. Their are mixed accounts as to the cause of the accident, those sympathetic to Repco suggest that failure of a front suspension frame weld did not occur and that Stan made a driving error. Graham Howard in his book, ‘The History of The Australian Grand Prix’ concludes, drawing on contemporary sources, that a weld failure caused the accident. Brian Burnett who built the chassis at Repco ‘explained that the two main chassis rails, of 4 inch 16g chrome molybdenum alloy steel , passed through holes in the diaphragm-type front crossmember and were completely electrically welded into position. These welds crystallised and cracked, and in the course of the Grand Prix one chassis tube eventually broke away and touched the ground. It was a problem as simple, as enormous, as unfamiliarity with new materials and techniques’ Howards book says. Jones was tight lipped at the time, and it was a gentler age when journalism did not go hard at a large corporate such as Repco. From Stans’ perspective it made no sense to bite the hand which fed him and be forthcoming in a manner damaging to Repco. The race continued and was won by Davisons’ HWM, the first of his four AGP wins, from Curly Brydon and Ken Richardson in MG Spl and Ford V8 Spl respectively. Brian Burnett, Maybachs’ body builder, Preston records, told Jones at the team de-brief at the Chevron Hotel that ‘he had driven too fast and recklessly’, Jones responded by flooring him with one punch! Out of character for a bloke who was generally the life of the party and a favourite with the ‘babes’, but perhaps reflecting Jones view that the destroyed car was not his fault. 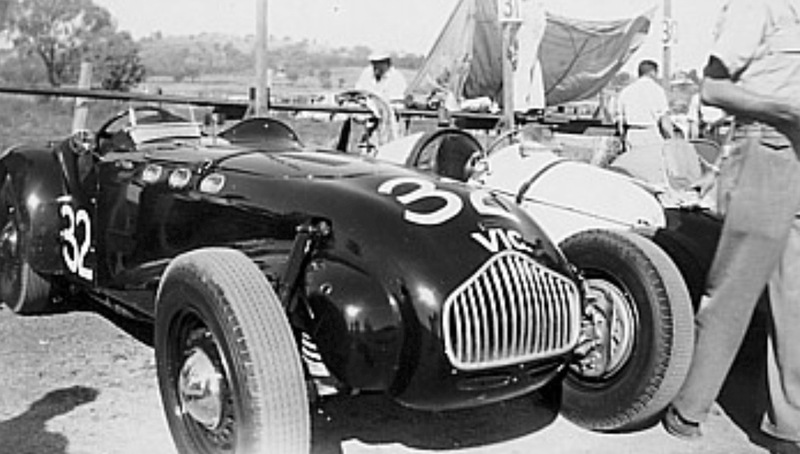 Jones was awarded the ‘Australian Driver of The Year’ in 1954 for his NZGP, Victoria Trophy, Bathurst 100 and Victorian Hillclimb Championship title wins. Shortly after returning from Southport Charlie Dean hired Phil Irving, already a famous engineer for his work on Vincent motorcycles and later the designer of the Repco ‘RB620 Series’ V8 which won Jack Brabhams 1966 World Drivers/Manufacturers Championships. Whilst Maybach 3 was being built Stan bought Jack Brabhams ‘Redex Special’ Cooper T23 Bristol when Jack left for the UK, his businesses continuing to prosper and funding some wonderful cars. At Fishermans Bend in February he qualified the Cooper on pole but finished third behind Davisons’ HWM and Hunts’ Maserati. 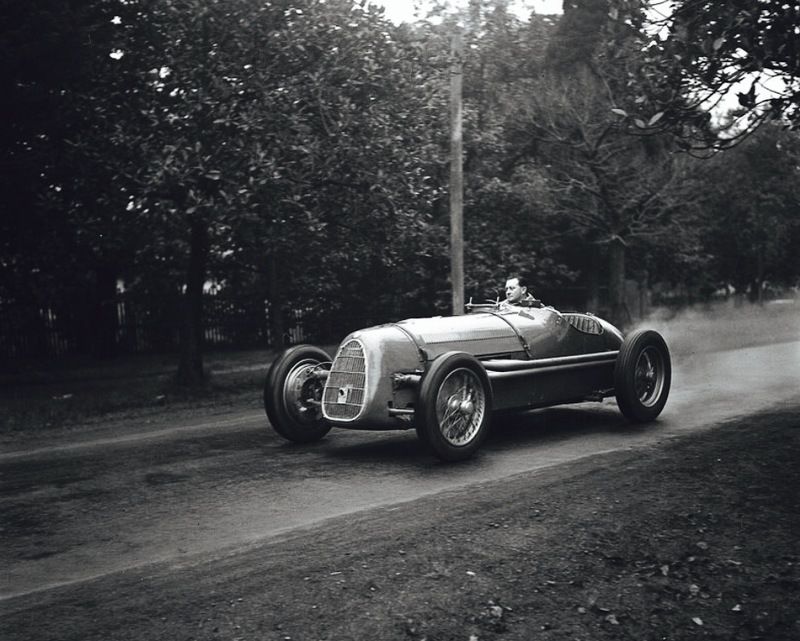 He ran the car again in the Argus Trophy at Albert Park in March finishing second to Hunts’ Maser and Whitefords’ Lago. He also raced the Cooper 1100 and a Cooper T38 Jaguar in sports car events, winning in the latter at Fishermans Bend in February and also racing it on the hills. Early in 1955 construction of the new Maybach commenced. To lower the bodywork the engine was canted at 60 degrees, offsetting the engine and driveshaft to the right, allowing a driving position left of centre. New rear axle housings and steel gearbox housings were built to Irvings’ designs. The remaining stock of 110mm stroke cranks were cracked, so a 100 mm one was used, with a 90mm bore the engines capacity was 3800cc. The special SU carbs could not be readily replaced so 6 Stromberg side draft carbs were used, the engine developing 240bhp @ 5000rpm. A similar suspension layout to Maybach 2 was used. Brakes were made from flat plate steel rolled into circles and then welded at the ends, the drums were machined internally and externally for attachment to the hubs. Brian Burnett again built the body which was inspired by the contemporary Merceds Benz W196 GP car. 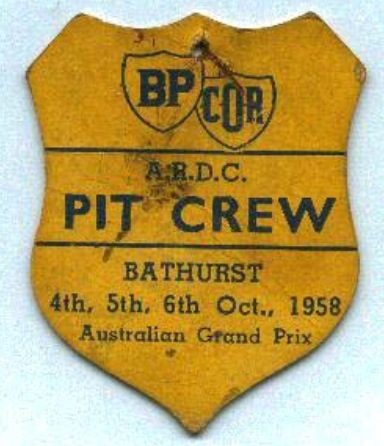 The car was finished in April 1955 and entered for the ‘Bathurst 100′ at Easter. It was timed at 145mph but had severe handling problems causing a spectacular spin, and finishing second to Hunts’ Maserati A6GCM. The car also had a severe flat spot and was not run in the ‘100’, Stan winning the Group B Scratch race in his Cooper 1100. It was found that the front cross member was flexing under braking, affecting the steering. Irving rectified the flatspot by devising a fuel injection system using the Stromberg throttle bodies, part throttle flow was regulated by a Lucas ignition distributor with fuel delivered by an aircraft fuel pump, when dynoed the engine produced 250bhp. Dean tested the car at Templestowe Hillclimb and Jones won the A.M.R.C Trophy at Altona, Melbourne in May from Ern Seeligers’ Cooper Bristol. 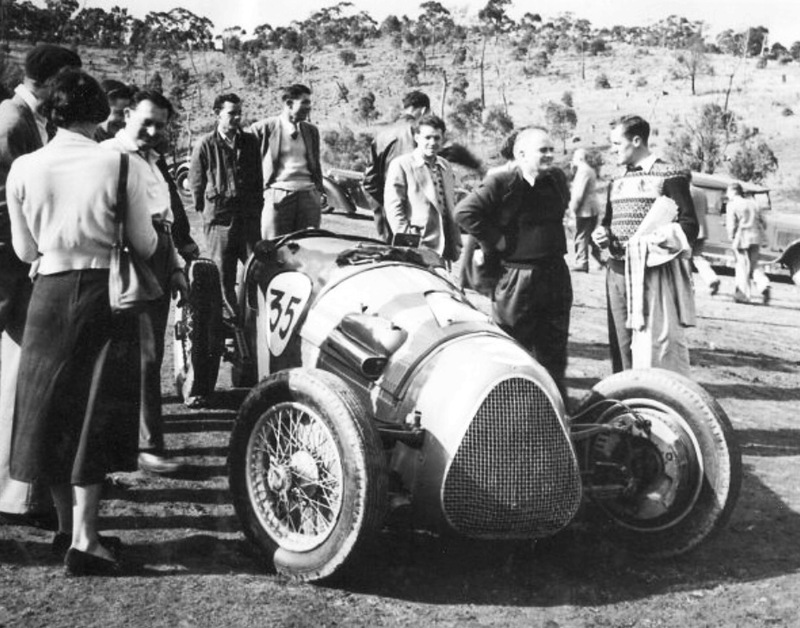 Jones raced the Cooper Bristol at Mount Druitt in Sydney in August, losing a wheel in practice but winning the preliminary race only to have the cars chassis snap in the 50 mile main race, fortunately bringing it to a halt without hurting himself. The car was fully rebuilt prior to the October 10 race and run in a preliminary event at Fishermans Bend the week before, Jones second to Hunt but happy with the cars performance. Jack Brabham was racing a Cooper Bristol T40 he built himself and hitherto fairly unreliable, won the race from Hunt, who had lead in his Maser A6GCM before breaking a rocker and Jones whose clutch failed. Doug Whiteford was third in his Lago. Maybach was next raced at Gnoo Blas, Orange, in January 1956 in the South Pacific Road Racing Championship meeting. Hunt took the lead by a small margin, Jones was second having lapped the field, Brabham a distant third. On lap 23 the Maybach broke a conrod, locking the wheels and sending the car spinning down the road- Hunt won from Brabham. Upon examination, the block and crank were badly damaged, there was little of Deans’ original cache of spares left and in any event the more modern cars from Europe, readily available at a price meant it was increasingly difficult to develop the Maybach to the required levels of competitiveness. After all those years Dean and Stan decided the cars ‘elite’ racing days were over. Maybach 3 was never really competitive and Reg Hunt ‘upped the local ante’ when he imported an ex-works Maserati A6GCM in late 1954. 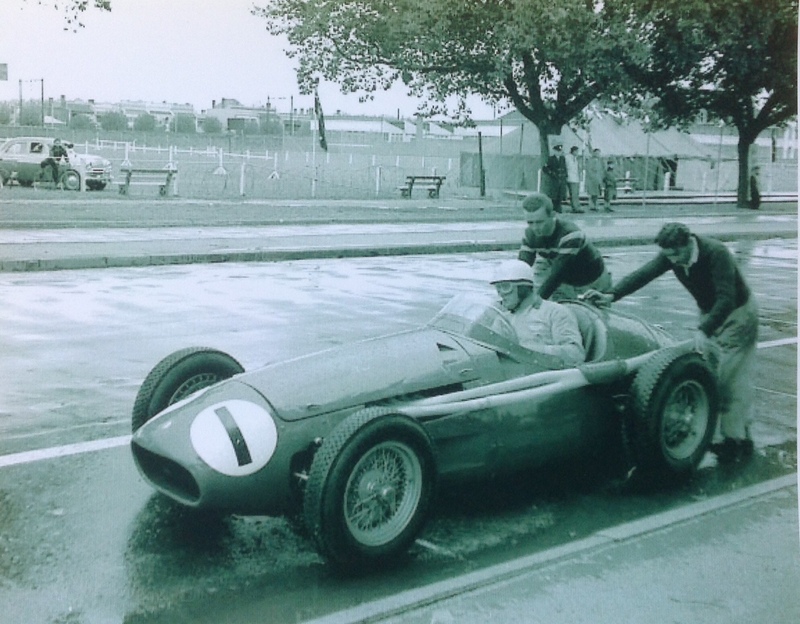 Lex Davison followed suit with his ex Ascari/Gaze Ferrari Tipo 500/625 3 litre, Stan having the resources, invested 10000 pounds to acquire a Maserati 250F, chassis #2520 and spare 3 litre 300S engine. 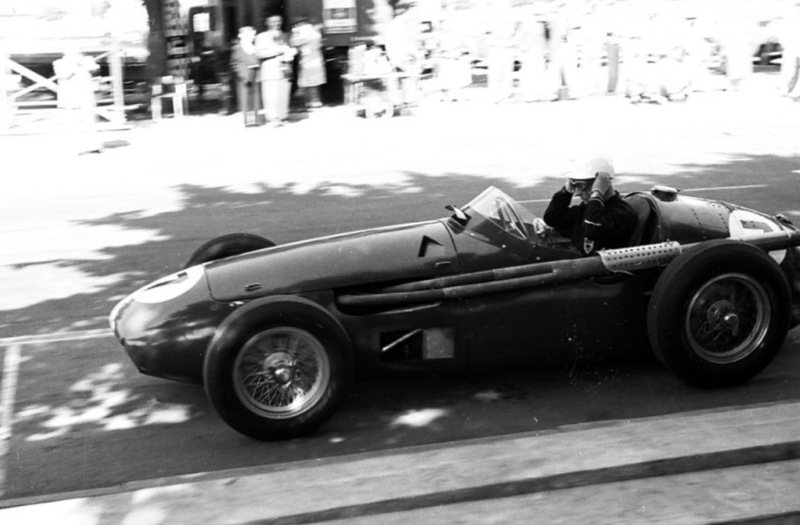 Stan despatched Charlie to Modena to do the deal, ‘2520’ was built in late 1955 to ’56 spec and used by Frolian Gonzalez and Pablo Gulle in the 1956 Argentinian and Buenos Aires GP’s respectively, (DNF and 8th) before being shipped to Melbourne arriving on the ‘SS Neptunia’ on April 22 1956. 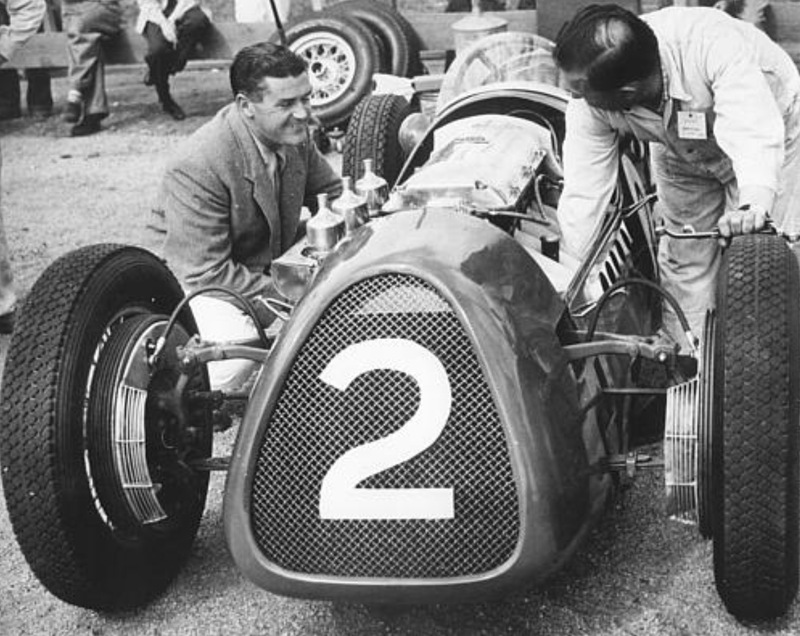 In any event Stan had the ‘ducks guts’, the most competitive customer Grand Prix car of the period, a tool with which he would demonstate his mastery over the following three years. 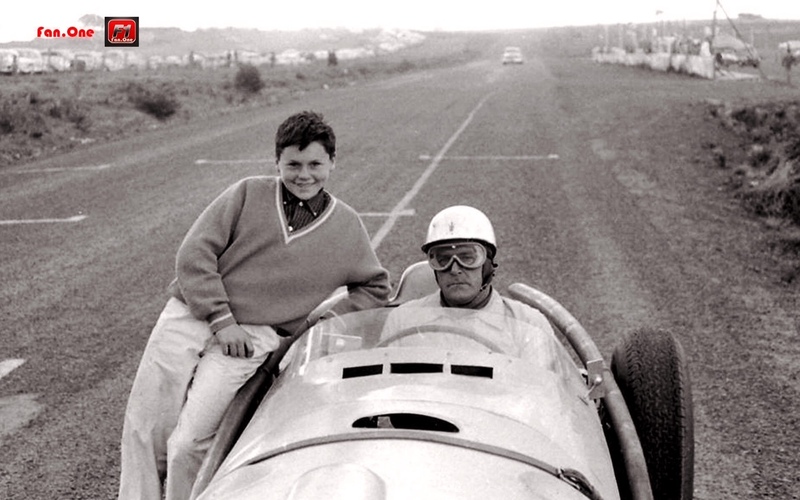 Jones raced the car for the first time at Port Wakefield, coming second in the wet to Stillwells’ D Type in the ‘SA Trophy’. He raced the car again in September at Bathurst winning both the 3 lap curtain raiser and ‘NSW Road Racing Championship’ later in the day setting a lap record in the process. 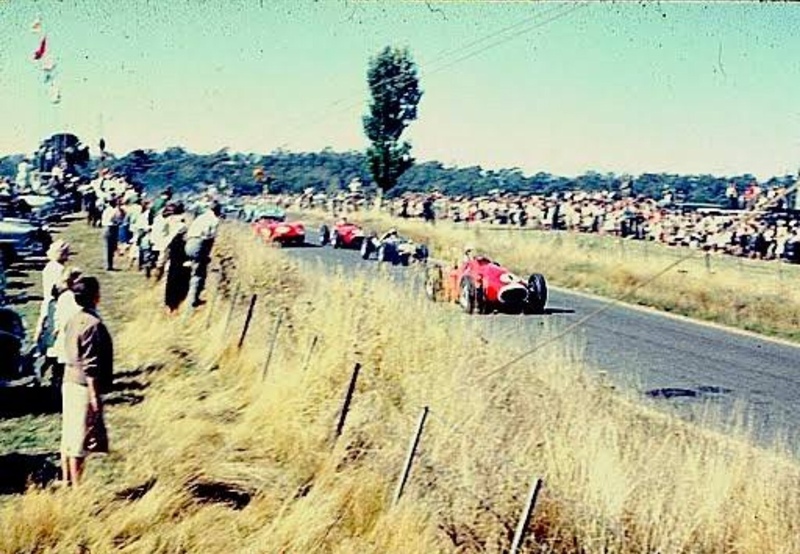 Melbourne hosted the Olympic Games in 1956, the AGP at Albert Park that November is still regarded as one of the greatest ever, certainly the best to that point in the races long history. Its the event which changed the face of motorsport in Australia, such was the calibre and competitiveness of the entry and scale of the event. 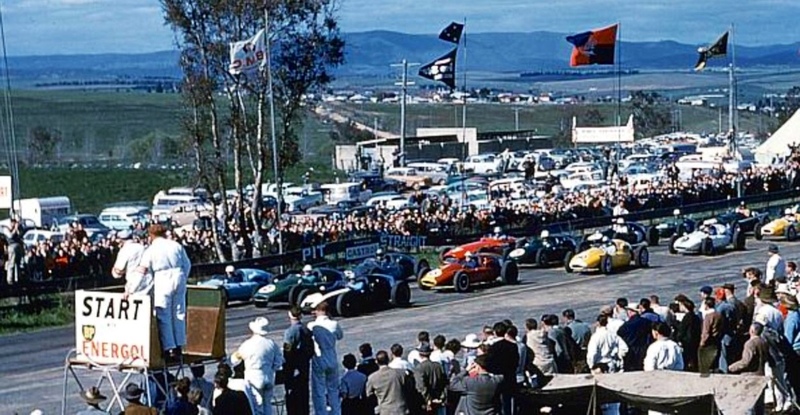 The meeting was a ‘double-header’ featuring the ‘Australian Tourist Trophy’ for Sports cars on the first weekend and the AGP the following one, with support races of course, the AGP still famous for those! 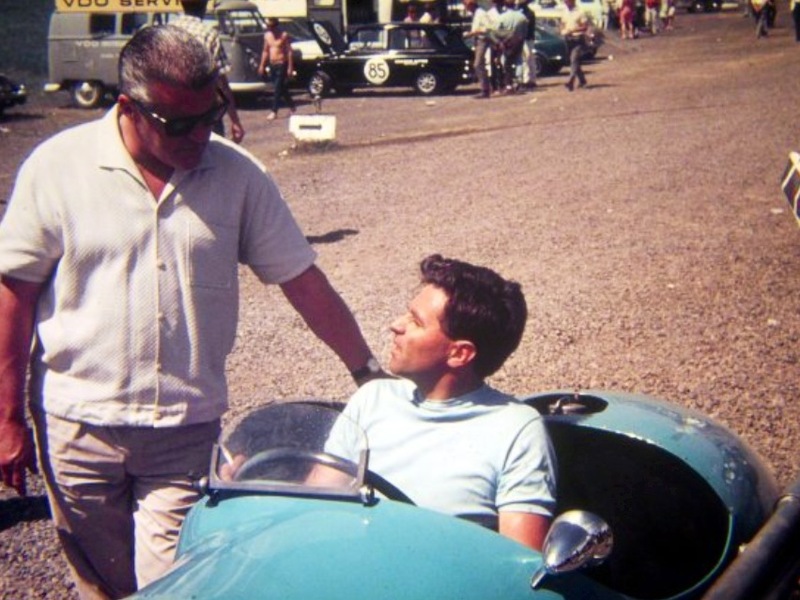 The overseas entry was headed by the factory Maserati team which brought 5 cars, 3 250F’s and 2 300S sports cars for Stirling Moss and Jean Behra. They based themselves at the Esplanade Hotel nearby in St Kilda, (still there, the ‘Espy’a great pub and band venue) the cars themselves housed in Maserati driver and local Holden dealer Reg Hunts’ premises in Elsternwick, also close to the circuit. So close that the 300S were driven to and from the track, adding to the cosmopolitan atmosphere. The large local Italian community, many of whom migrated post-war turned out in force to support the red cars. Other Maserati 250F’s were entered by Ken Wharton, Stan and Reg Hunt with Kevin Neal in Hunts’ old A6GCM. Ferraris were entered for Peter Whitehead and Reg Parnell, 555 Super Squalos’ with 860 Monza 3.5 litre 4 cylinder engines. The strong field would test the local talent who were in cars in more or less equal performance to the vistors- Jones and Hunt in their 250F’s, Davison in his venerable 3 litre Ferrari Tipo 500. By that stage Whiteford’s Lago was long in the tooth but he ran his 12 plug T26C as did Owen Bailey in Dougs’ old, successful car. Moss disappeared into the distance from Behra with local interest the battle of the ‘Melbourne drivers’ Jones, Hunt and Davison. Moss initially lead Behra, Whitehead, Parnell, Davison, Hunt, Neal and Jones. Baileys’ half shaft failed on the line. Jones was fast early, passing Hunt with Wharton, Parnell and Davison dropping back. Rain started to fall with the Jones/ Hunt dice continuing until Jones eased with smoke coming from under the Masers long bonnet, post race this was found to be a broken crankcase breather pipe leaking onto the exhaust. Rain started to fall heavily with 10 laps to go Neal crashing the A6GCM into a tree breaking both of his legs and the those of the official he collected in the process. Moss won by nearly a lap from Behra, Whitehead, Hunt, Jones, Parnell and Davison. The duel between Hunt and Jones was the first and last in similar cars, Hunt shortly thereafter retiring from racing, neither Stillwell or Glass as competitive in the car subsequently. Jones continued to also compete in Rallies finishing second in the ‘Experts Trial’ and getting hopelessly bogged in the wastes of North Queensland in the ‘Mobilgas Trial’ co-driven by Lou Molina, legendary Melbourne racer, restauranteur and raconteur. Stan shipped the Maser to NZ for the Grand Prix at Ardmore in January hoping to repeat his earlier success, the race included internationals Reg Parnell, Peter Whitehead and Jack Brabham, Stan qualified well and in a tough 240 mile race of 3 hours 7 minutes !, finished third in a typically gritty drive from Parnell and Whitehead both in Ferrari Super Squalo 555’s fitted with 3.5 litre ‘Monza’ engines. Stans 250F, 2.5 litres. Bib Stillwell raced the ex-Hunt 250F, Reg having retired and depriving the sport of more Hunt/Davison/Jones battles. 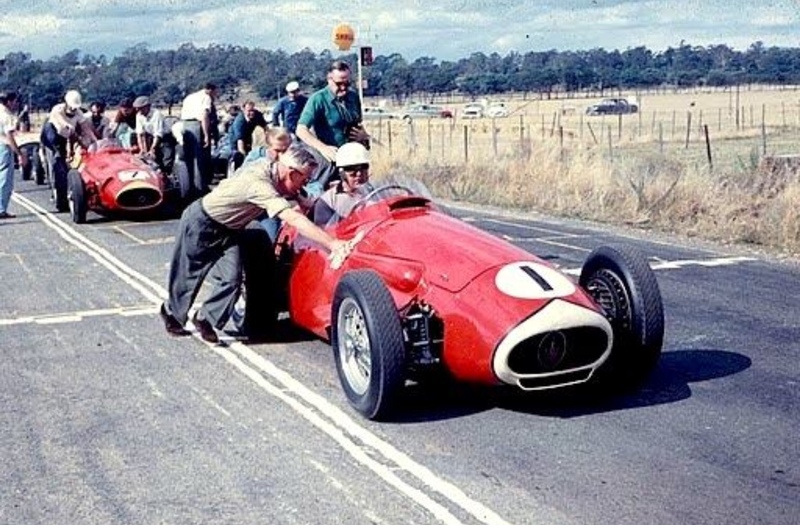 The Maserati also gave Stan a lot of unreliability grief, his fortunes in it changing when Otto Stone took over its preaparation after the 1957 AGP held in searing 104 degree heat at Caversham in WA. Jones was initially awarded victory after a stunning drive, on a lap count back, 2 days later, Davison got the win albeit with Bill Patterson as his co-driver, tough-nut Stan driving the distance on his own…Alec Mildren also thought he (Mildren) had won the race. Lex Davison won five rounds of the championship that year winning the Gold Star from Tom Hawkes Cooper T23 Holden and Stan. Jones only Gold Star win for the year was in Queensland winning the ‘Lowood Trophy’ in August. At Bathurst a UJ broke, at Lowood a spur gear, back at Bathurst the clutch failed. Stan entered the Maser in the Victorian Trophy meetings, over two consecutive weekends in March, winning a preliminary event from the Davison Ferrari 500/625 and Brabhams’ F2 Cooper T41 Climax, but his engine let go in a big way in the 100 mile ‘Trophy’ race whilst chasing and catching Davison in the lead. A conrod broke carving the block in half after setting fastest race lap on this ‘big balls’ circuit. Davison won from Brabham and Hawkes. 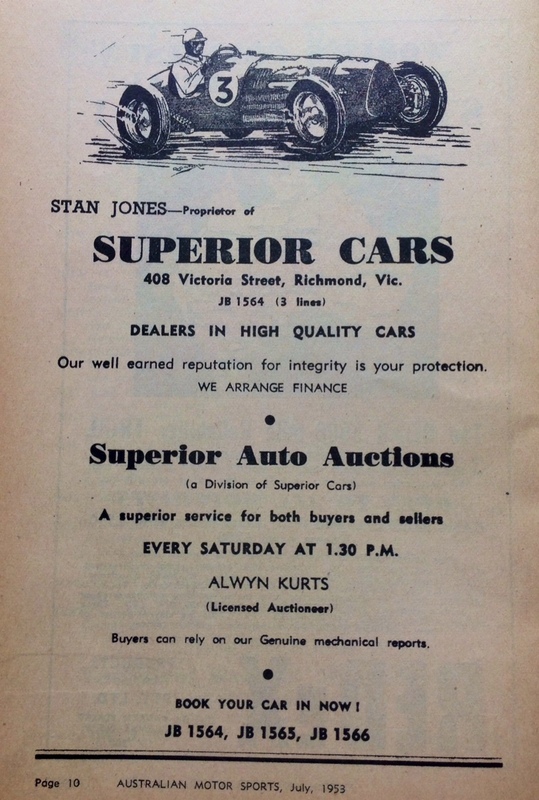 Stans businesses continued to expand, he was awarded a Holden franchise, ‘Stan Jones Motors’ was located at 408 Victoria Street, Richmond/Abbotsford. Many of his fellow ‘elite racers’ were also motor-traders including Bib Stillwell, Lex Davison, Bill Patterson, Alec Mildren, Arnold Glass, Stan Coffey and Reg Hunt. 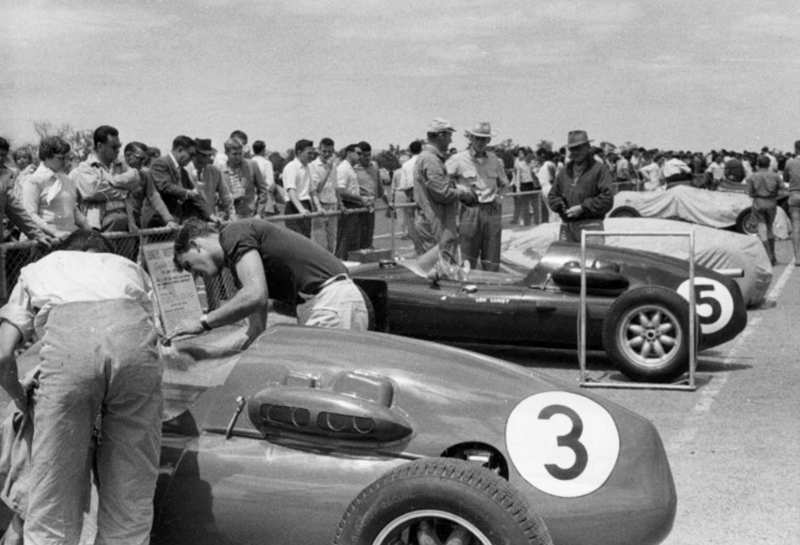 Stan won at the Victorian Tourist Trophy Meeting at Fishermas Bend in February 1958 from Arnold Glass in a Ferrari Super Squalo and Doug Whiteford in an ex-works Maserati 300S sports car acquired from the Maserati team after the ’56 AGP. 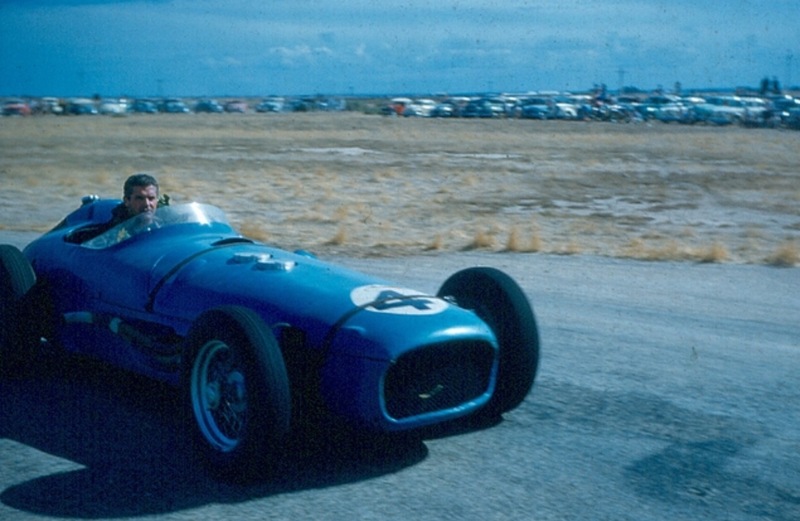 In a consistent year with the now well prepared and reliable Maser Stan also won the final round of the championship, the Phillip Island Trophy race and scored second places at Gnoo-Blas, (Orange NSW), Longford and Lowood, Queensland and won the title from Alec Mildren and Len Lukey in Coopers T43 Climax and T23 Bristol respectively. In a year of relative consistency Stan amassed enough points to win CAMS coveted ‘Gold Star’ for Australias’ Champion driver. It was a fitting reward for one who had contributed so much to the sport and been a drawcard from the moment he stepped into Maybach 1. The Australian Grand Prix win he had strived for for so long was finally his with a win on the power circuit of Longford in Tasmania 1959. Stans 250F was at its peak, lovingly and skilfully prepared by Otto Stone, Stan beat Len Lukeys’ Cooper T43 Climax at just the right moment. The day of the front engined GP car was over in Australia, a bit later than in Europe. Stan was fortunate their were no 2.5 litre Coventry Climax engined Coopers in Australia at that stage, Lukeys’ little 2 litre did not quite have the ‘mumbo’ to do the job on Longfords long straights, but if anyone deserved some luck Stan certainly did! Jones lead from the start followed by Lukey and Whiteford, Whiteford’s Maser 300S did not survive the landing off the railway line spraying copious amounts of oil over Lukey. The lap record was taken by Jones, Lukey and Glass. Lukey lead for 6 laps, Jones regained the lead, tapping Lukeys’ Cooper past the Prince of Wales Hotel. Glass made a bid for the lead, getting right up to Jones, but had to use the escape road at Mountford Corner, his brakes locking. He recovered, joining the circuit still in third in front of Mildrens’ Cooper. Jones worked his away back to the front again, and built a small lead over Lukey, winning by 2.2 seconds from Lukey, Glass 2.5 minutes behind them and Mildren 39 seconds behind Glass. Ted Grays’ Tornado, the other outright contender had troubles in the qualifying heats and ran a bearing in the fabulous Lou Abrahams built Australian Specials, Chev V8 on lap 4. 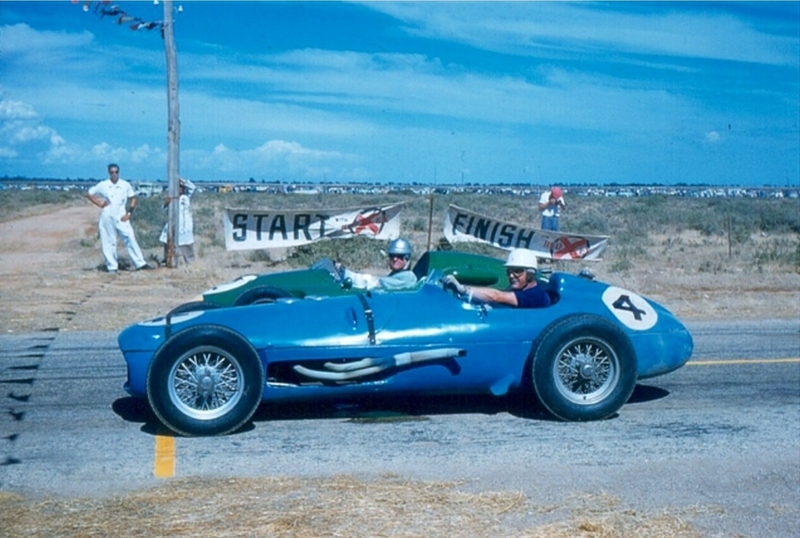 Stan contested the Gold Star Series again in 1959 winning at Port Wakefield in Maybach 4, the car, still owned by Jones, was modified by Stans friend Ern Seeliger by fitment of a Chev Corvette 283cid V8, de Dion rear suspension, a 30 gallon fuel tank and less weight. The dry sumped Chev was fitted with 2 four barrel Carter carbs and developed 274bhp at 6000rpm and 300ft.lbs of torque. The last victory for the car was that race at Port Wakefield, in March, in back to back wins with his AGP triumph. 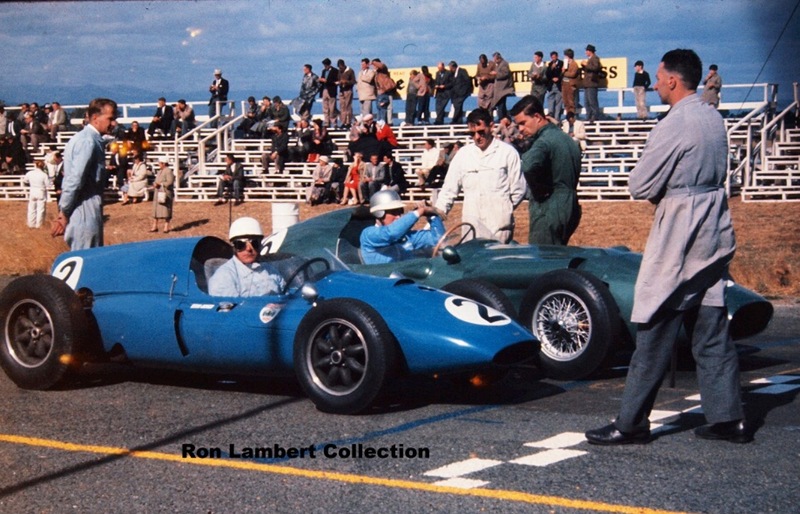 The 1959 Gold Star Series was very long at 12 rounds Len Lukey winning it in Coopers T23 and T43 Climax from Alec Mildren in Coopers T43 and T45 Climax and Stan. 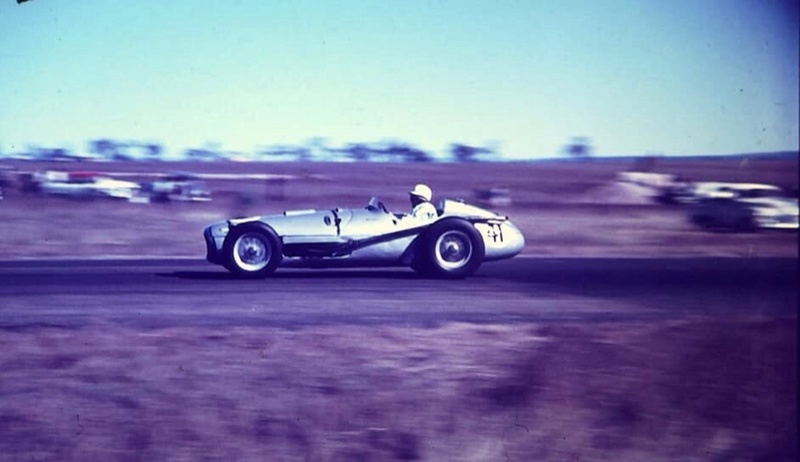 The Maser was advertised for sale at 4500 pounds (selling some years later for circa 2000 pounds) , Maybach 4 pressed into service at the AGP held in 1960 at Lowood, Queensland in June. The Chev engine failed after four laps, Alec Mildren taking a fanastic win by less than a second after a race long dice with Lex Davisons’ Aston DBR4/300. Mildrens’ car was a clever combination of Cooper T51 chassis and Maserati 250S engine taken out to 2.9 litres, deservedly, he finally won the Gold Star that year, and then retired, forming a race team and over the following decade putting far more back into the sport than he ever took. The mid engined way forward was clear, Stans new Cooper T51 2.2 Climax arrived in time for the NZ Grand Prix at Ardmore in early January 1960. Stans’ practice times were fifth quickest of a grid which included Stirling Moss, David Piper, Denny Hulme and Len Lukey all driving Coopers. 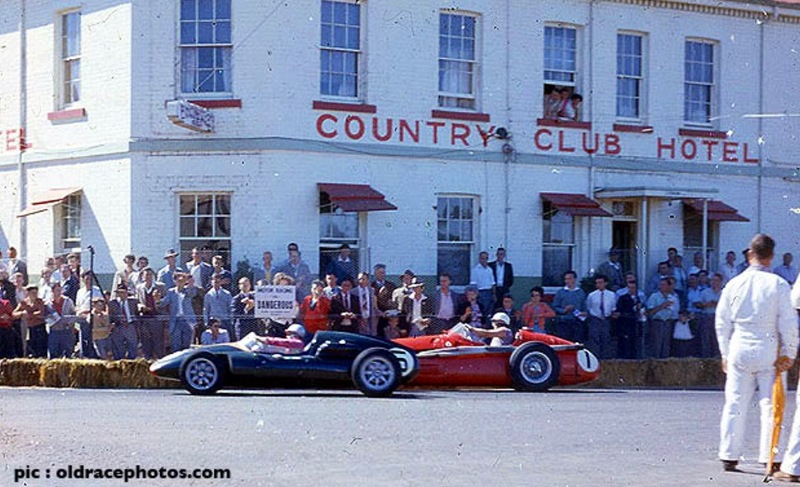 Stan contested the ‘Craven A International’ at Bathurst in October 1960. 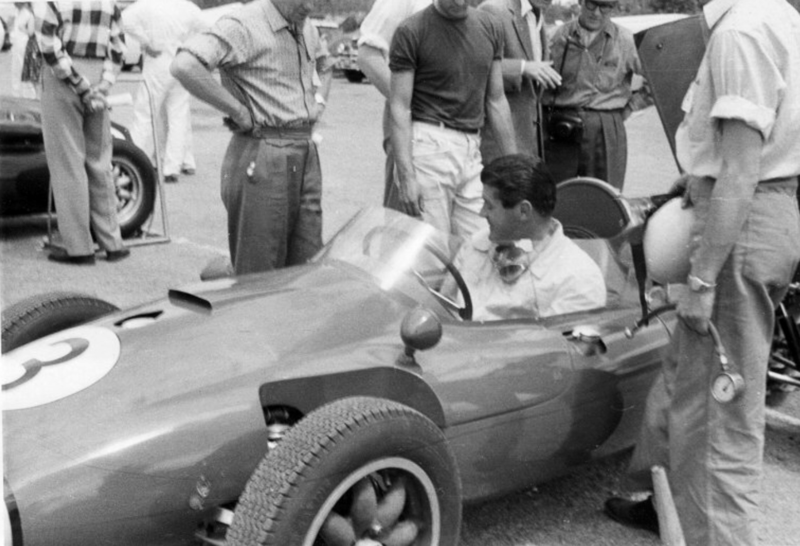 He retired the car in a lap one accident, the race won by Jack Brabham, also Cooper T51 mounted. Grand Prix Racing changed from a 2.5 to 1.5 litre Formula in 1961 but many internationals contested our summer races…bringing 2.5 litre ex-GP cars, the ‘Tasman Series’ still 3 years away. Stirling Moss, Innes Ireland, Dan Gurney, Graham Hill, Ron Flockhart as well as our Jack raced in Australia that summer. Stan missed the opening Gold Star round at Warwick Farm but was the fastest of the locals, making a particularly big impact on Dan Gurney at the ‘Victorian Trophy’ meeting held at Ballarat Airfield in mid February. He was fourth, bested only by Gurney and Hill in their BRM P48’s and Ron Flockharts’ Cooper T51 Climax 2.5. Jones lead home the locals Stillwell, Mildren, Glass and Miller all in Cooper T51’s. The oldracingcars.com commentary of the ’61 season asserts that Jones was the quickest of the Australians at the start of ’61 but only won later in the year at Lakeside in July. At the ‘Longford Trophy’ in March he had a DNF on lap 4, the race won by Roy Salvadoris’ Cooper T51 Climax. At the ‘Queensland Centenary Road Racing Championships’ at Lowood in June he finished 3rd behind Bill Patterson and Mildren, both Cooper T51 mounted. 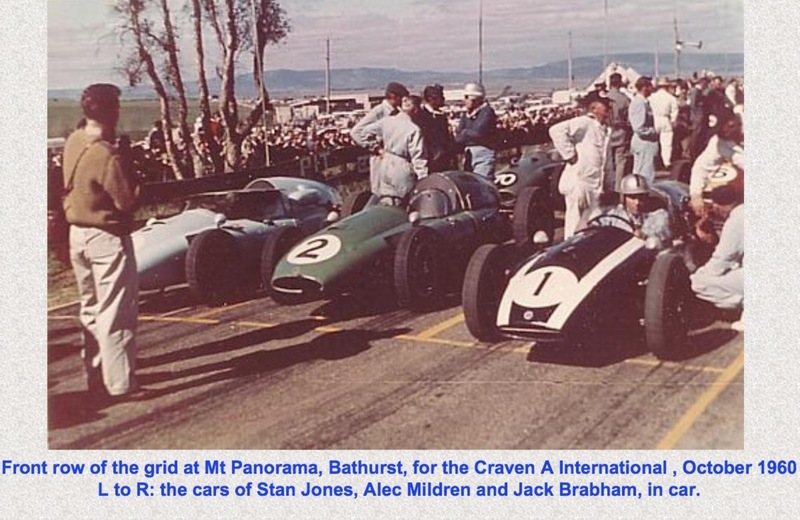 In April he contested the ‘Craven A Gold Star’ event at Bathurst finishing 2nd to Pattersons winning Cooper T51, Pattos’ Cooper and the 4 behind Jones 2.3 Climax all 2.5 litres in capacity or bigger. In 1961 there was a credit squeeze in Australia as the Menzies Governement tightened monetary policy to control inflation with the usual brutally fast consequences of an instant drop in consumer demand. Cars included. Sales on Jones’ multiple sites dropped and continued to decrease as consumers kept their wallets in their pockets or could not obtain consumer credit, nowhere near as sophisticated or as common as it is today. Superior Motors was sold in 1960. If you were highly geared, as Stans businesses were, you were in trouble, his assets were progressively sold as his cashflow could not keep up with creditors demands. 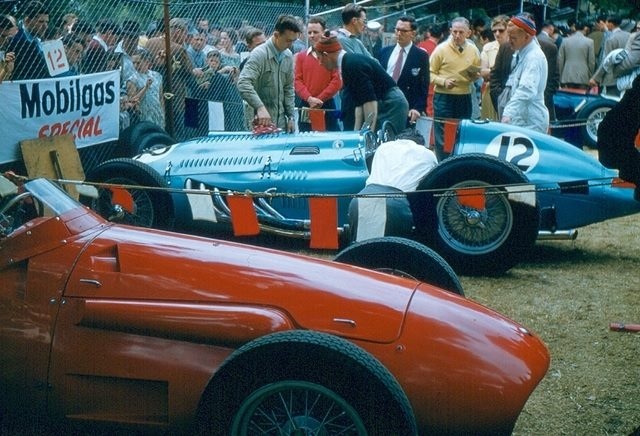 Stan initially raced on and won the ‘Lakeside Libre Race’ in the Cooper in July, ahead of Arnold Glass’ Cooper T51 Maser and the Lotus 18 Ford FJ of Bruce Coventry. He didn’t start the 1961 AGP at Mallala, South Australia, the race won by Lex Davison in a Cooper borrowed from Bib Stillwell, David Mckay was penalised for a jumped start and lost a race many believe he should have won, Davos’ AGP luck legendary! The Gold Star was won by Patterson from Davison, Jones equal third with Bib Stillwell despite not competing at most rounds and having his mind on much bigger issues, his financial survival. 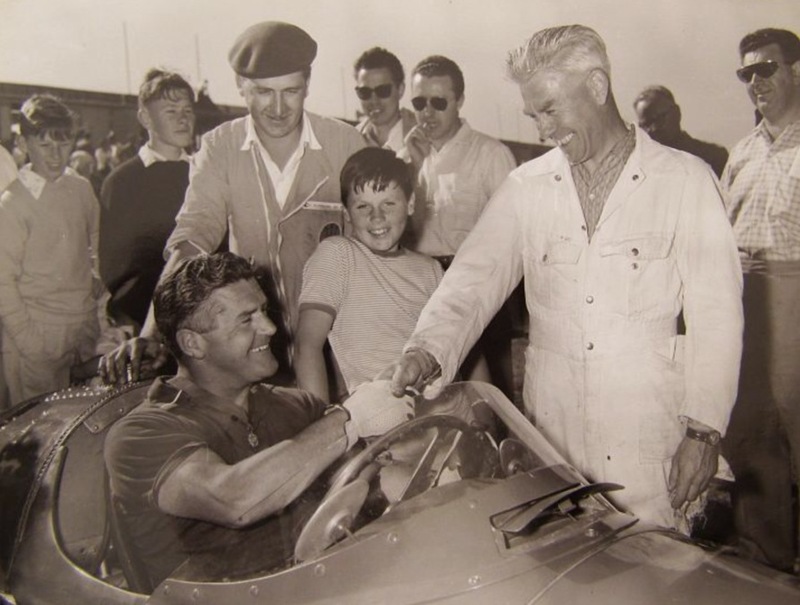 That unfortunately was the end of Jones’ racing career, he simply no longer had the financial means to compete, the fastest Australian at the start of 1961 was effectively retired twelve months later. 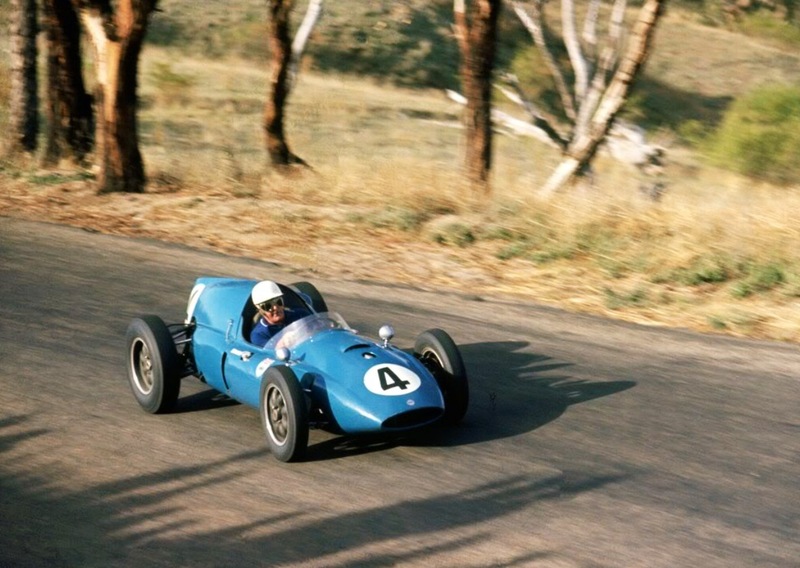 Jones retained the Cooper, racing it at local Calder, Victoria, events several times into 1962. Whilst for sale, the 250F had not sold, Stan ran the car in an historic demonstration event at Sandown in November 1963, which seems to have been his last competition outing. By 1965 the car was sold and running in historic events in the UK. Stan was ‘a player’, his marriage to Alma ended in divorce, Stan gained custody of Alan and moved to The Boulevard in Ivanhoe, a more salubrious address than Yongala Street, Balwyn. By the mid-sixties all of Stans businesses had been sold and he was struggling to find an income, all of this tumultuous for Alan, by then in his late teens. Jones suffered two debilitating strokes in the mid-sixties. Alan, after an initial trip in 1967 moved to the UK to pursue a racing career in 1969, Stan moved there to live with Alan and Beverley, AJ’s first wife. He died in a London hospital in March 1973 just short of his 50th birthday. He was a shadow of his former self but a family friend who visited the Jones’ in London spoke on the ‘blogosphere’ of Stan using two walking sticks but still looking dapper and smart. 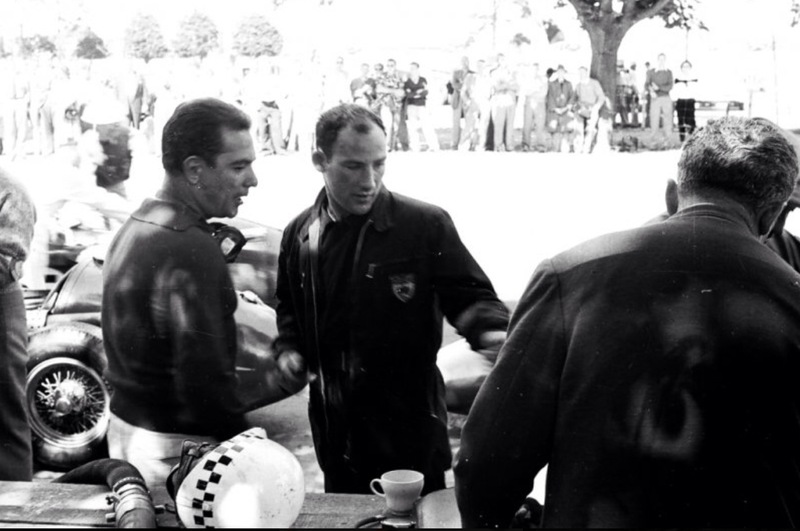 Champion Racers both, Stan and Alan…and in elite company with Antonio and Alberto Ascari. It is much harder to rate the drivers of the period as they raced mainly cars of different performance. It isn’t like today when drivers come through controlled junior formulae and into controlled senior formulae including F1! telemetry and the like making the job of picking who is fastest easier. The competitor set includes Doug Whiteford, Lex Davison, Jack Brabham, (whom i have excluded from this analysis given he went overseas) Reg Hunt, Ted Gray, Alec Mildren and Len Lukey. Guys like Bib Stillwell peaked later and David McKay wasn’t in single seaters until the very end of Stan’s career so lets say that is the ‘elite group’, based either on results or speed- Ted Gray an example of the latter. Whilst their is some chatter about the merits of Jones on the ‘blogosphere’, of more relevance are contemporary reports of those there in the day, assessing the drivers of the day in the context of the day. 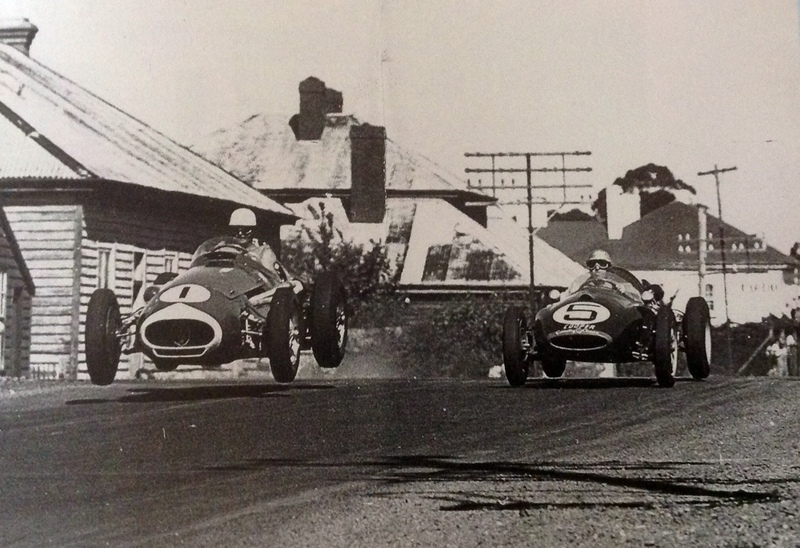 ‘Australian Motorsport Yearbook 1958/9’ refers to Jones ‘two most important overseas appearances have done more to put Australia on the map than many other drivers’. His ‘finest achievement must still be driving an Australian Special against International drivers in works cars in the first NZ International GP.’ ‘On the results of these experiences (the other being the Monte Carlo Rally) Jones should then have spent one season overseas; his potential as a racing driver, was superior, at the time to Jack Brabham’. Stans adaptability is mentioned above, that was not unique at the time as circuit events were not as common as now so drivers with the means had to be prepared to travel interstate and to do trials, rallies and hillclimbs to get their ‘racing fix’. Jones had the financial means to race, but so too did the ‘competitor set’ above, all sucessful businessmen/racers with the wherewithal to match their skill. 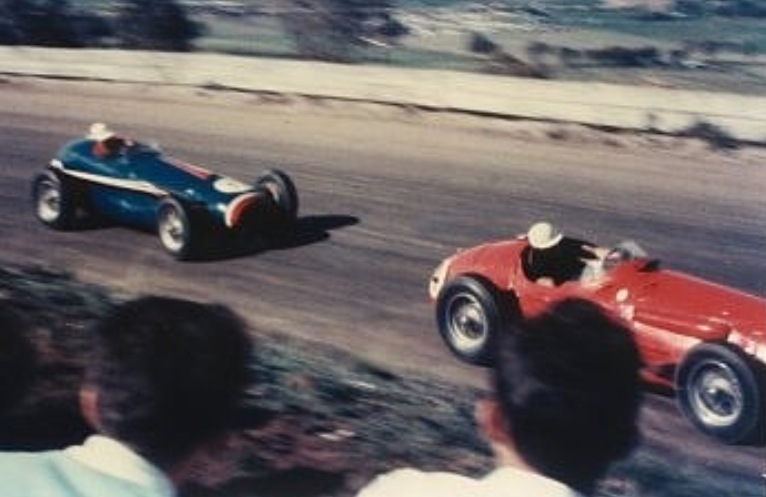 As the oldracingcars.com analysis earlier states, Stan was the quickest local driver in 1961…Dan Gurney stating after racing against him at Ballarat Airfield, ‘wow he is some driver that Stan Jones’. He successfully made the change from front to mid-engined cars, he was as adept in his Cooper Climax as Maybach 4, both entirely different beasts raced successfully in the same year. Was he our fastest of the period? Probably. Its a pity Whiteford bought a 300S rather than a 250F from the visiting Maser factory team post the ’56 Albert Park GP, equally its a shame Hunt retired- those battles would have been interesting and perhaps conclusive. Was he the best in the period? Possibly. Perhaps mechanical sympathy, important at the time was a slight negative. Lex Davison is the other ‘best’ contender and an honorable mention should be made of Hunt who really wasn’t around long enough in outright cars to call it- he definitely had a car advantage when the A6GCM arrived, raising the bar and forcing others to buy ‘Red Cars’. The importance of the Research & Development ‘Skunkworks’ Dean created at Repco post-war is important to recognise. 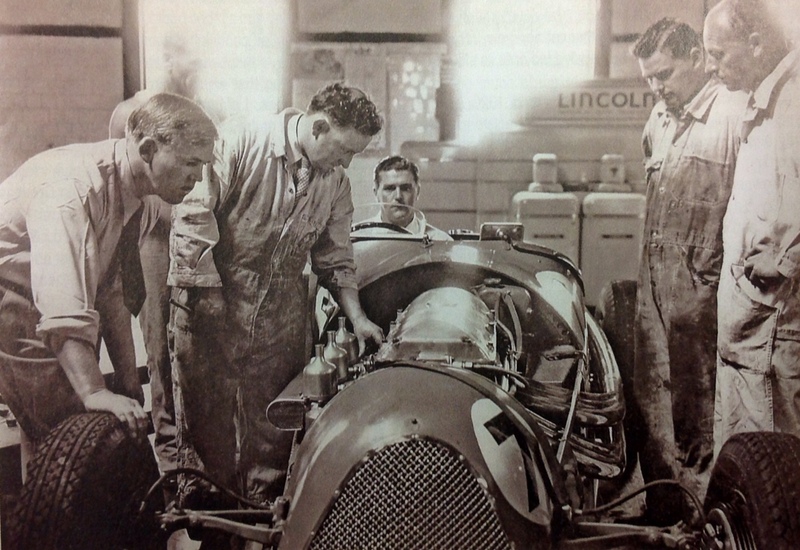 Its existence and focus on development by racing attracted an incredible number of talented engineers who graduated from the ‘Repco University’ and achieved much within Repco or more often outside it. Repco engineering alumnus include Ivan Tighe, Paul England, Peter Holinger, Nigel Tait, Michael Gasking, George Wade, Don Halpin, Frank Duggan, John Brookfield, John Judd, John Mepstead, David Nash, Ian Stockings, Ken Syme, Brian and Norm Wilson and many others. Phil Irving is not on this list as he was already of world renown when he joined Repco. This unit within the company lead to the Coventry Climax FPF maintenance program in the early ’60’s, this and the capabilities of the engineers made possible taking on the Jack Brabham request to design and build the 1966/7 World Championship winning ‘RB620 and 740’ Series of engines, a program supported and sponsored by Dean, by that time a Repco Board member. Board membership was a considerable achievement in Deans career as Repco were for many years an Australian Stock Exchange Top 200 company. Even though by then he wore a suit, by thought, word and deed he was a ‘racer’ to his core and a fine engineer to boot. 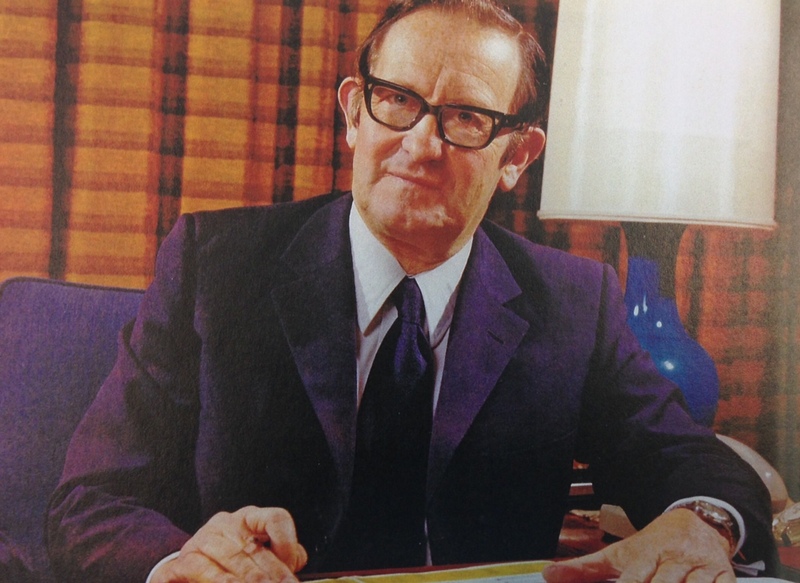 As a Repco Director he retired compulsorily at 60 in 1973, then doing a variety of engineering projects, and some property refurbishment work. He died suddenly in 1984 after suffering a fatal blood clot following surgery after a fall moving a concrete slab at his home. To my knowledge his story has not been fully told but it is well covered in Malcolm Prestons’ great book referred to in the bibliography.